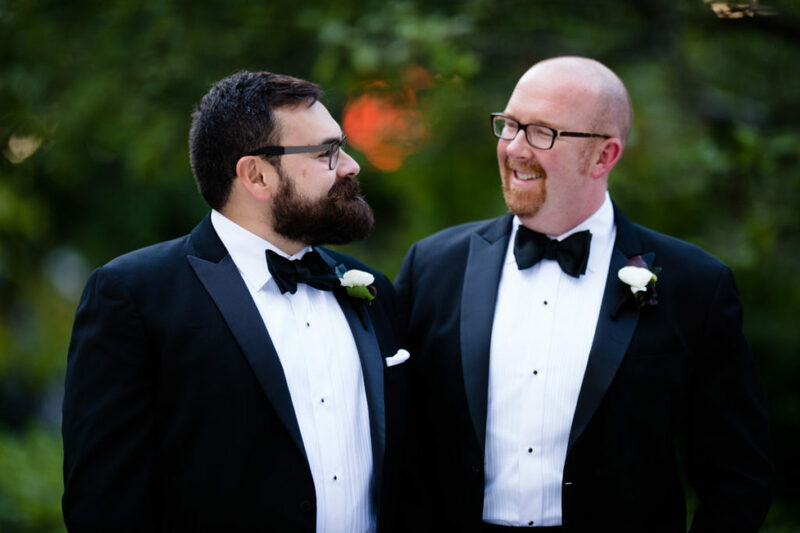 Casey and Agustin’s wedding day was such a blast to be a part of—it always brings a smile to our faces when looking back and reflecting on all the amazing details that made this day special! 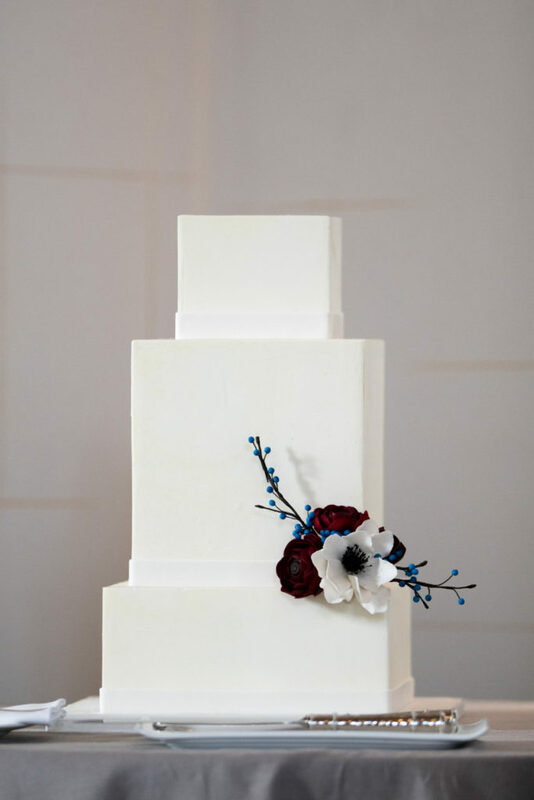 The elegant three-tiered Banana cake was filled with Blueberry Preserves and Passion Fruit Buttercream. 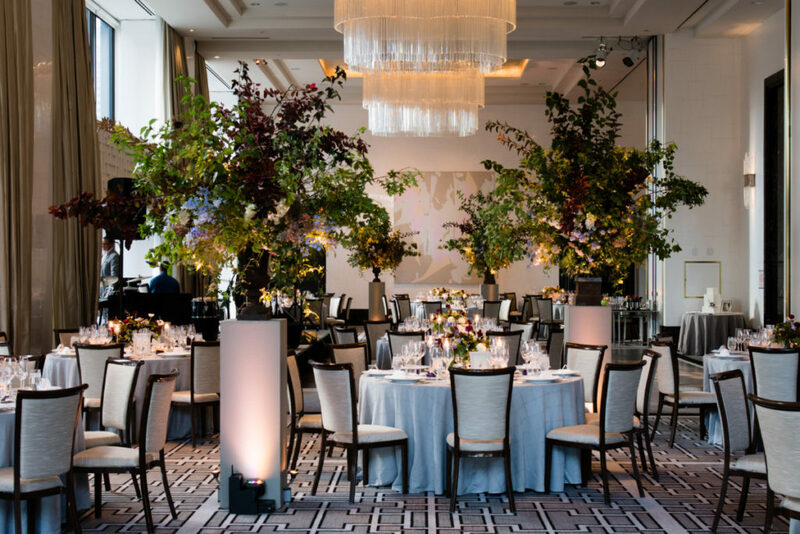 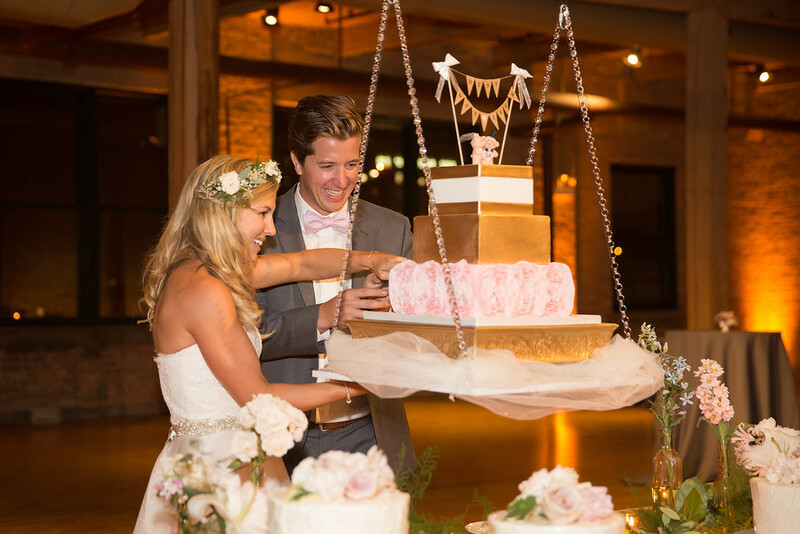 The all-white square wedding cake was the perfect compliment to this stunning Chicago venue. 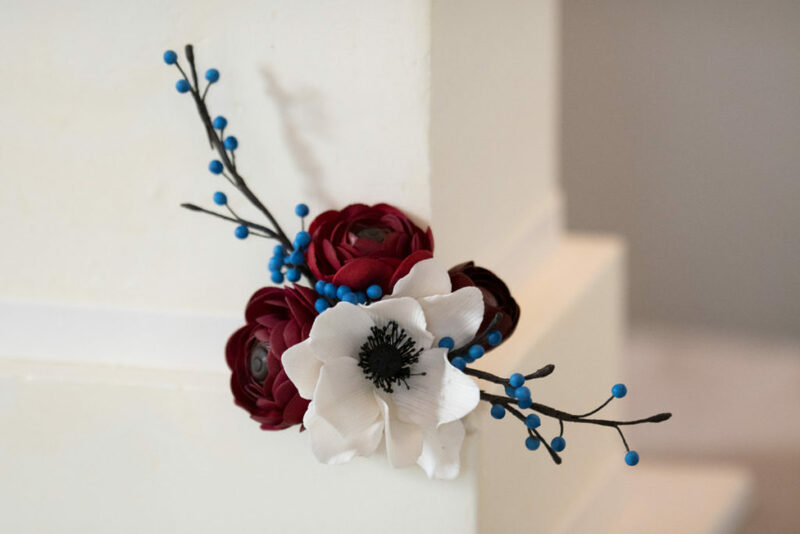 We’re always fans of adorning cakes with sugar florals, and beautiful deep red and white flowers added a burst of color on this classic cake design. 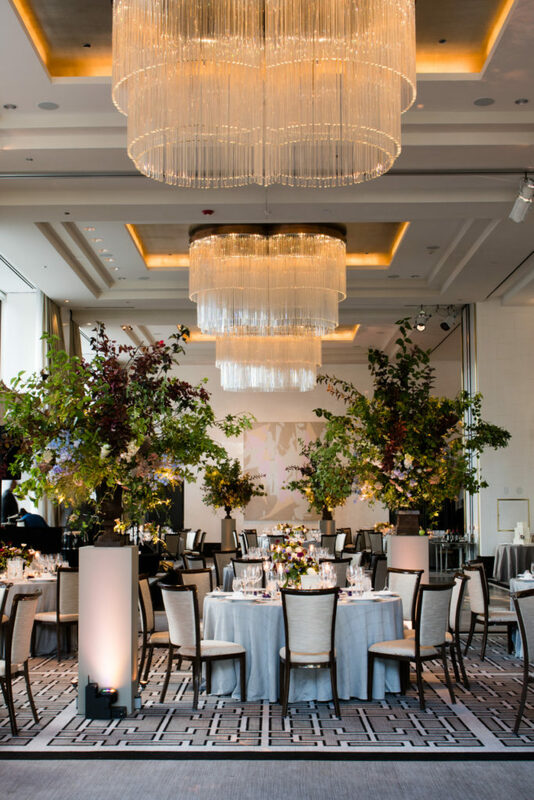 Incorporating light blue seeded twigs also added an additional element of depth, which we always love! 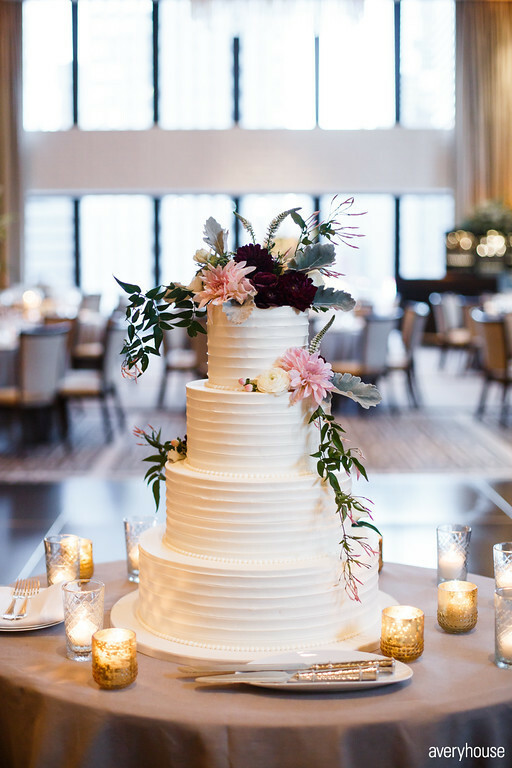 Colorful embellishments and decorative depth really transform any cake from simple to chic, and this timeless white wedding cake is a perfect example. 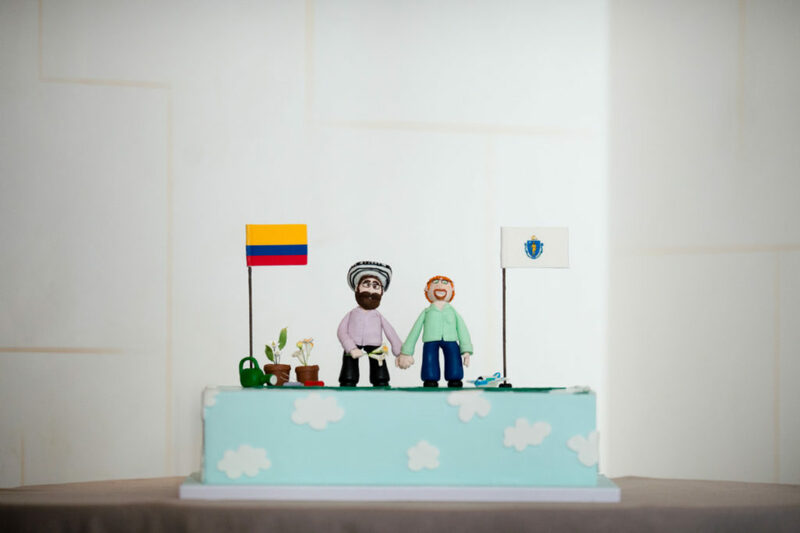 Adding a more personal touch to this love-filled day, Casey and Agustin incorporated a creative groom’s cake as well to really add to the fun! 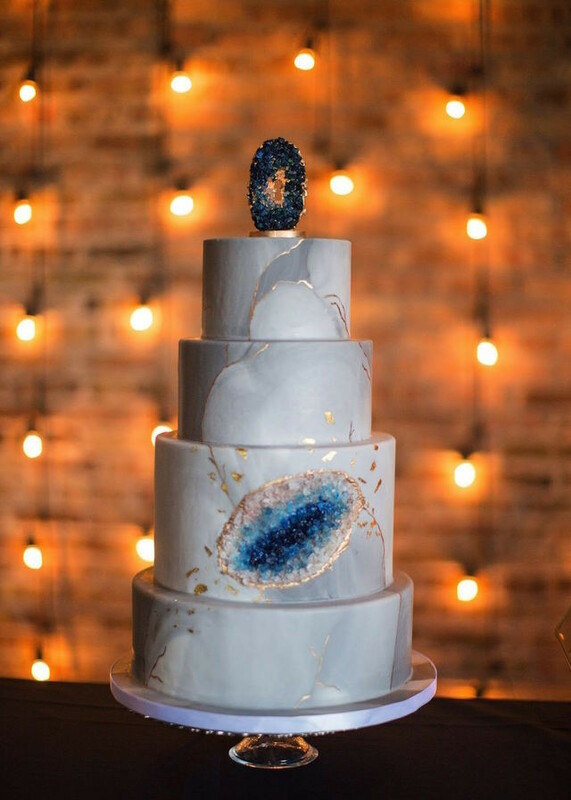 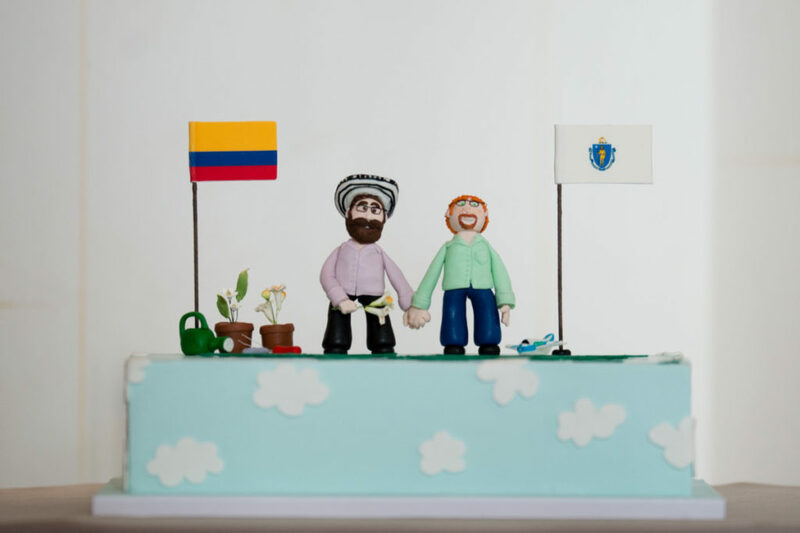 Representing the two of them as individuals and their unique passions was a great way to ultimately represent their great dynamic as a couple—the two really compliment one another, even seen through this one-of-a-kind cake design! 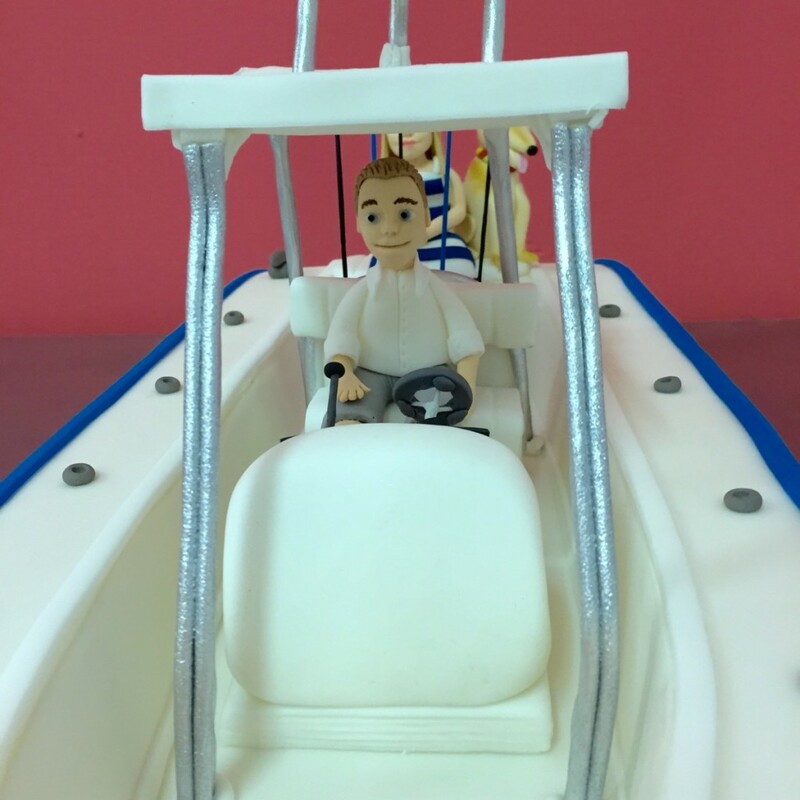 From flowerpots to mini airplanes, this groom’s cake personifies the breathtaking love these two share. 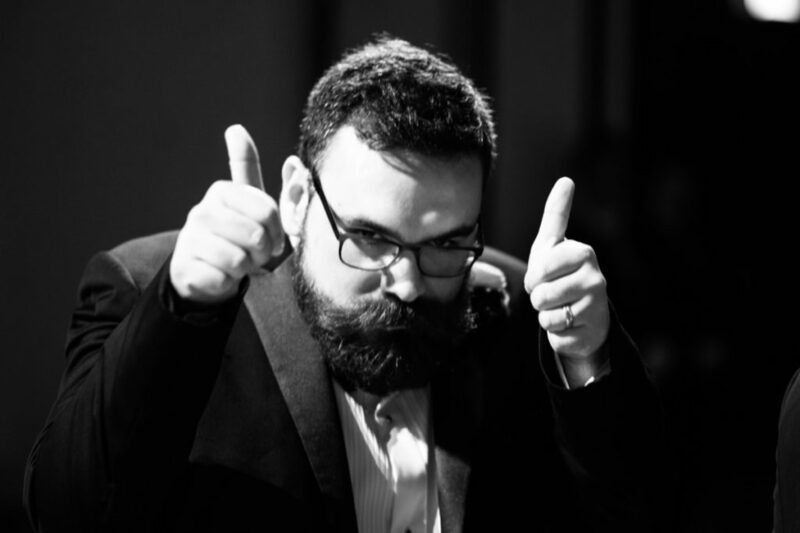 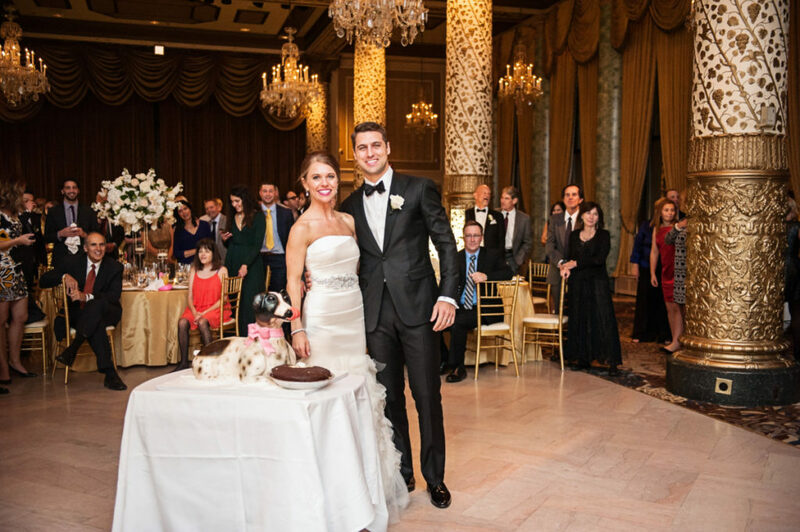 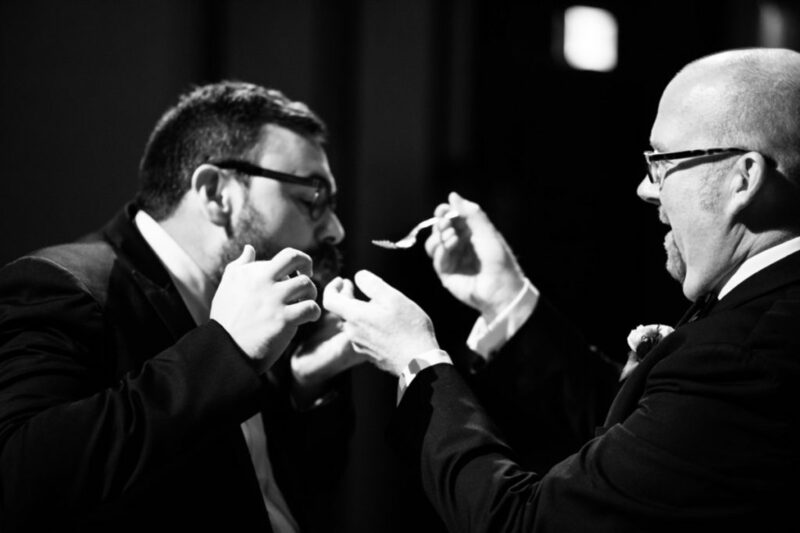 Take a look below at Casey and Agustin’s special day below! 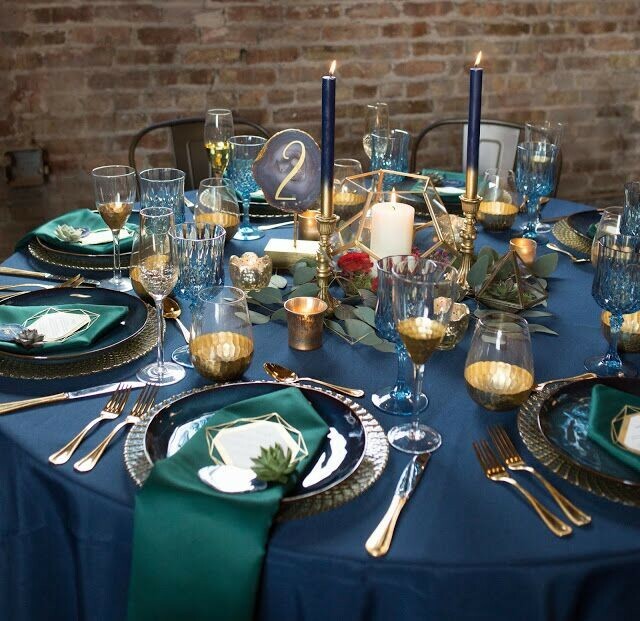 Our team participated in a fantastic shoot published in Chicago Style Weddings Magazine that centered around infamous china patterns, such as this lavish art deco pattern! 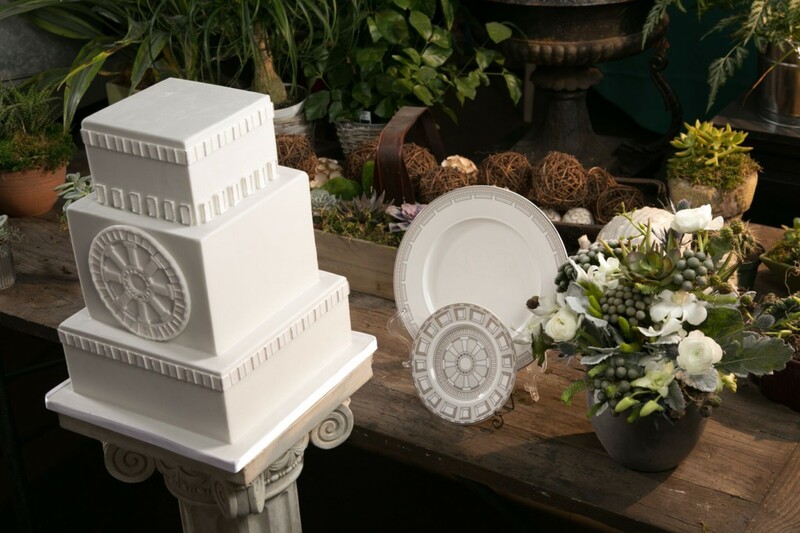 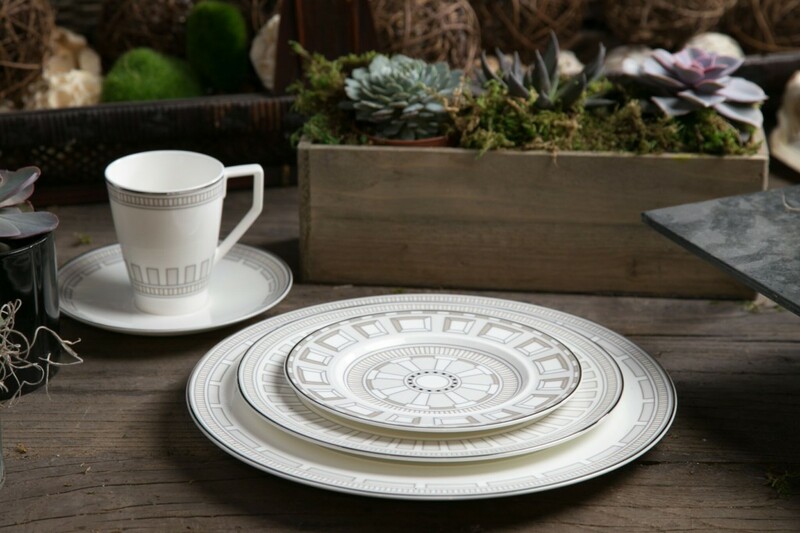 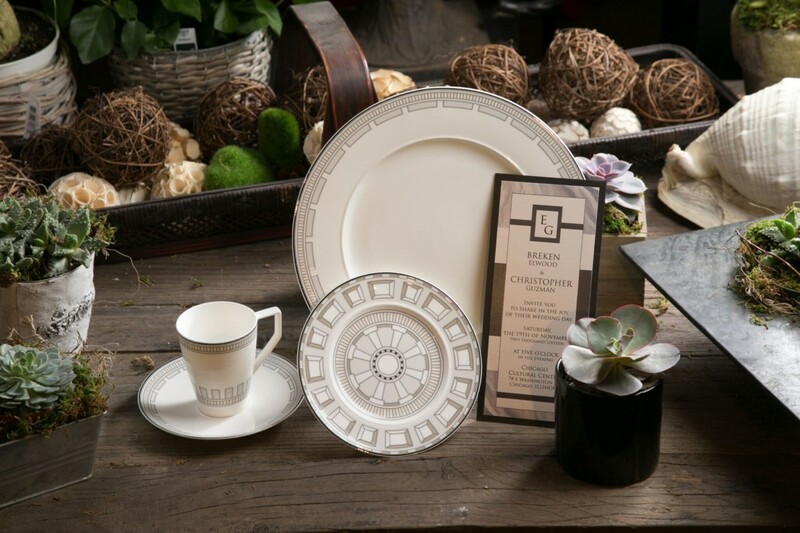 This simple grey and white geometric china laid the perfect foundation for a timeless cake design. 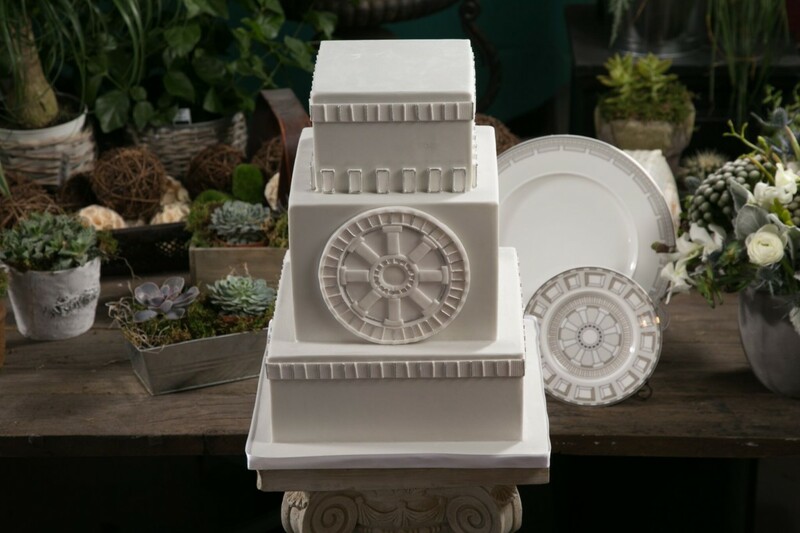 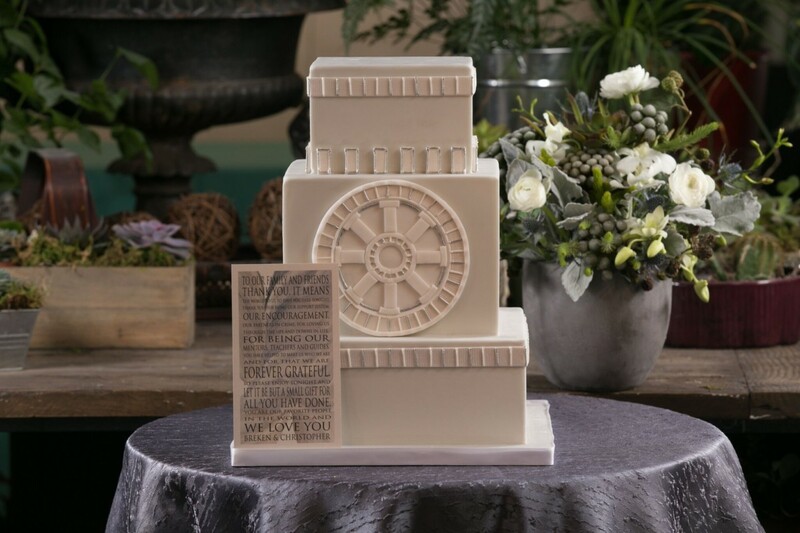 We began constructing this three-tiered cake with an industrial aesthetic in mind, which perfectly personified this classic china pattern. 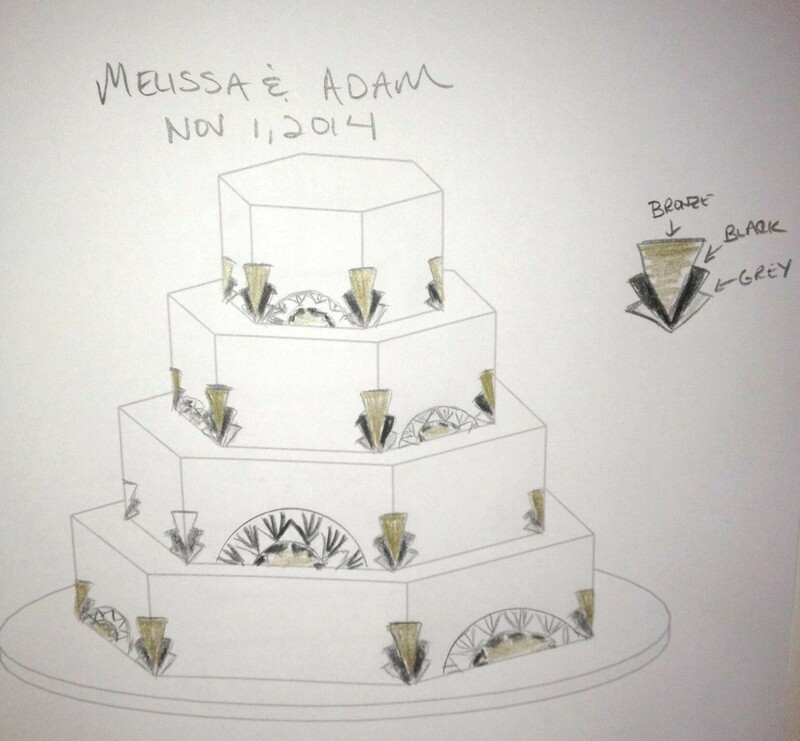 White fondant detailing and minute silver accents ultimately brought this design to life! 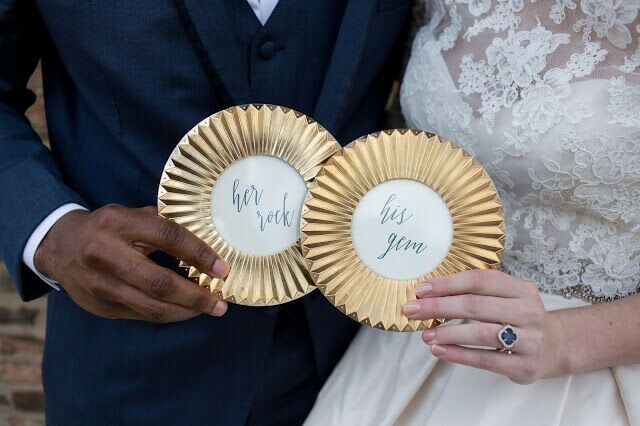 We could not be happier to have worked with such a talented vendor team on this one-of-a-kind styled shoot! 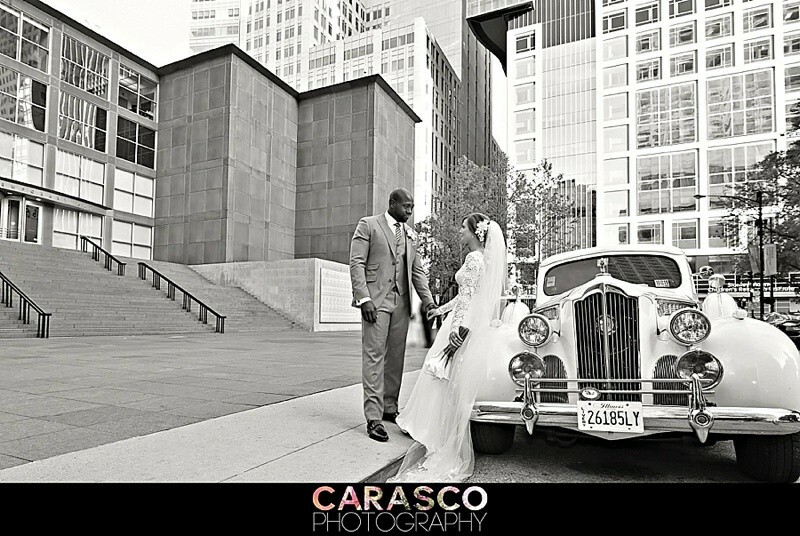 Chicago Style Weddings | Photography & Videography: Rush Photography and Video Productions | Styling: Frank Event Design | Venue & Flowers: Anna Held Floral Studio | Invites: EIGHT21 Studios designs by Carol Woldhuis | Rental: Hall’s Rental | Linens: BBJ Linen | China: Char Crews, Inc.
Styled shoots are such a fantastic opportunity to explore new creative avenues—like this china-inspired shoot for Chicago Style Weddings! 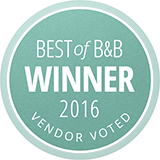 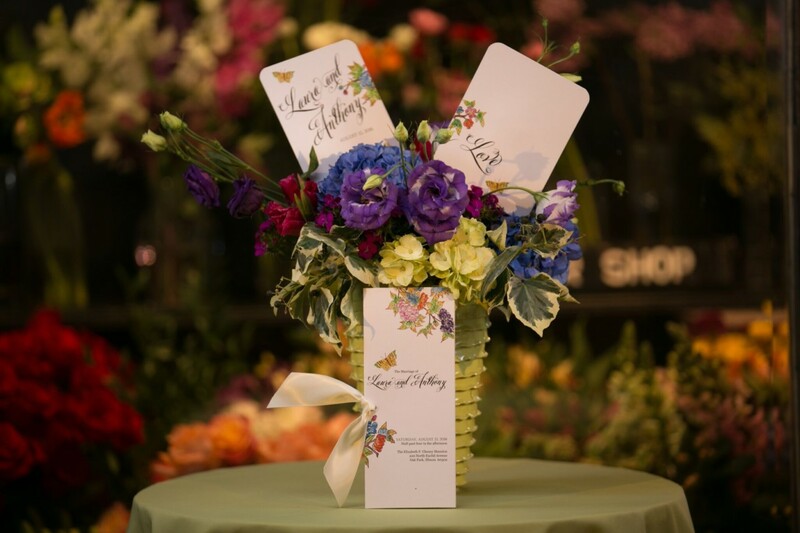 We were honored to work with Frank Andonoplas from Frank Event Design on this. 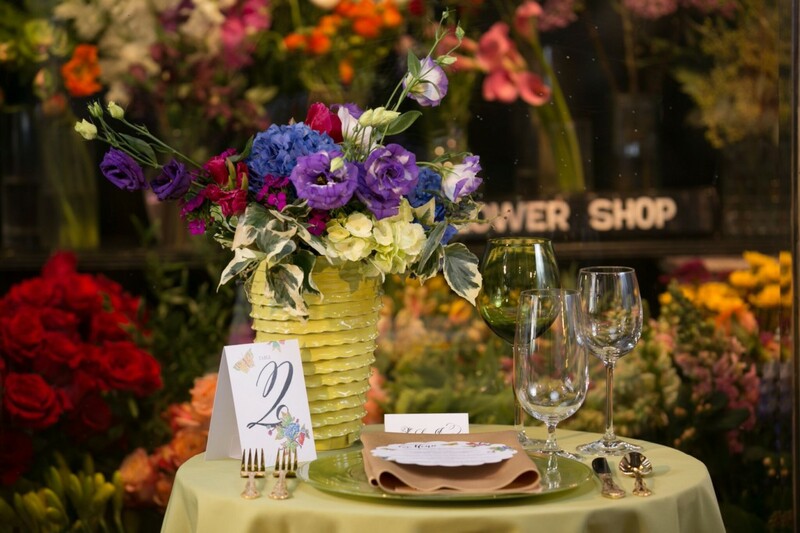 From the floral design by Anna Held Floral Studio to the table setting supplied by Char Crews, this great shoot is chock full of playful, charismatic colors and décor. 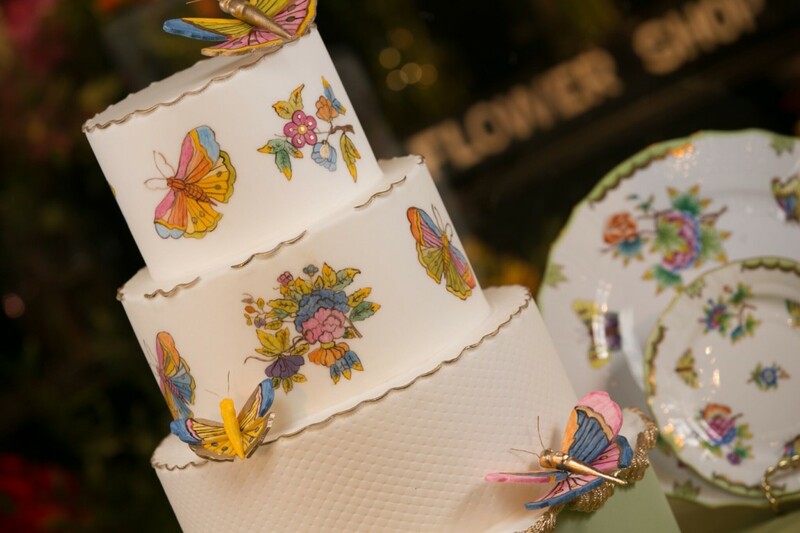 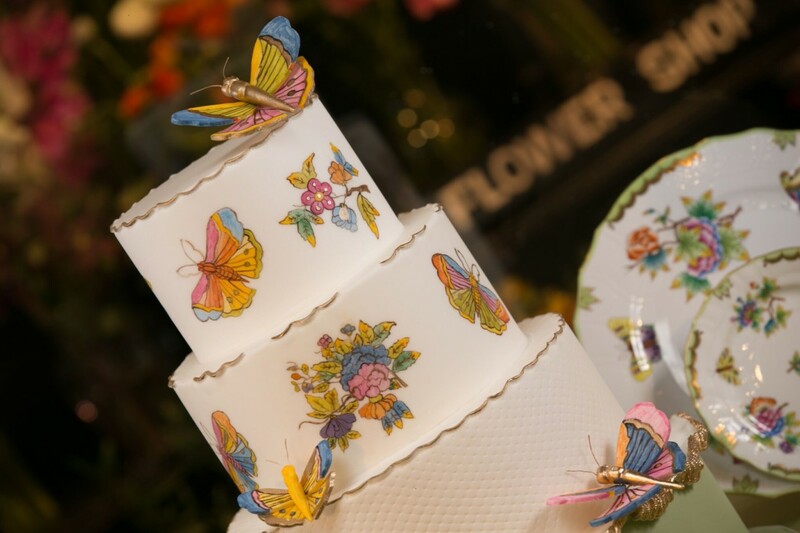 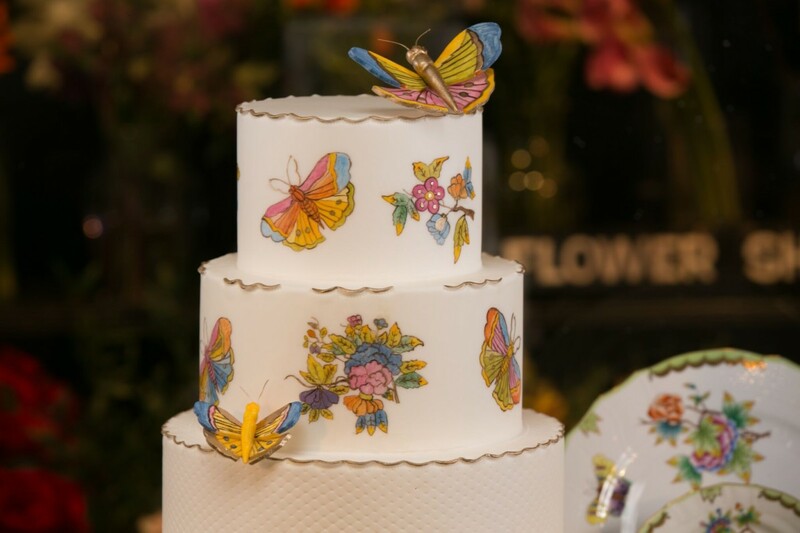 This quadruple tiered cake is adorned with hand-painted butterflies and flowers, playing off of the fanciful china. 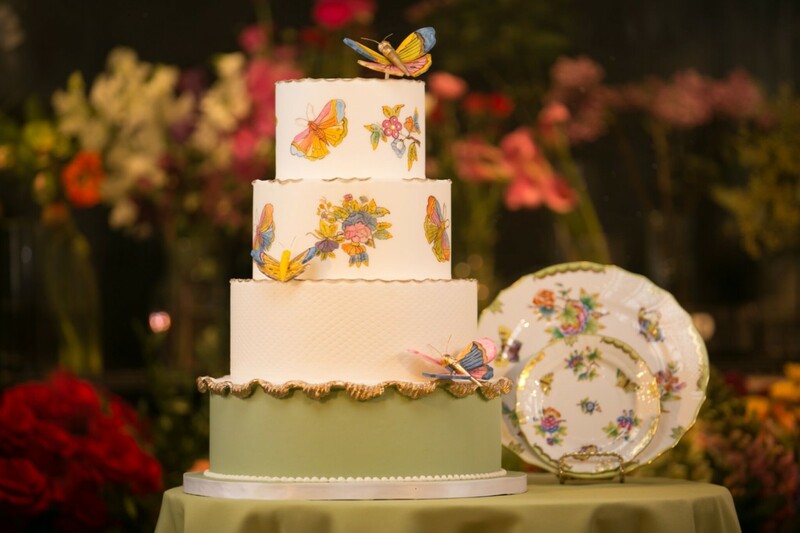 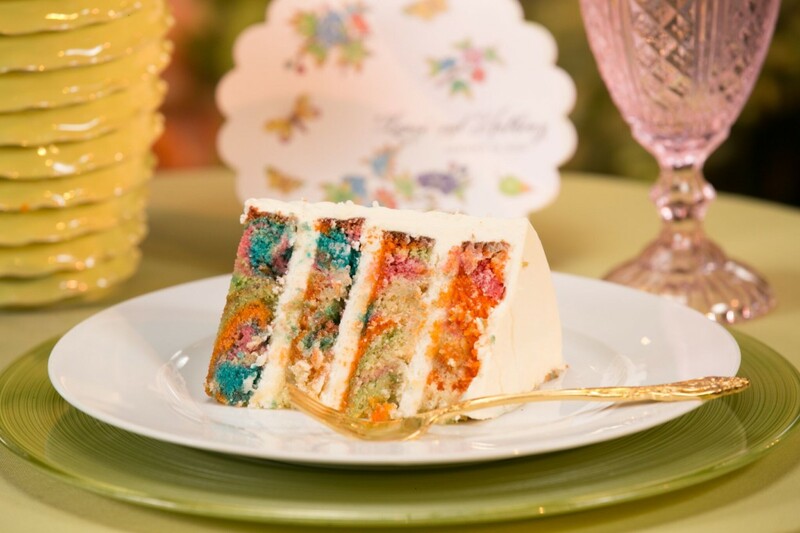 While this cake’s ornate detailing mirrors the place setting, we also constructed fondant butterflies to really bring the cake fantasy—and whimsical fantasy—to life. 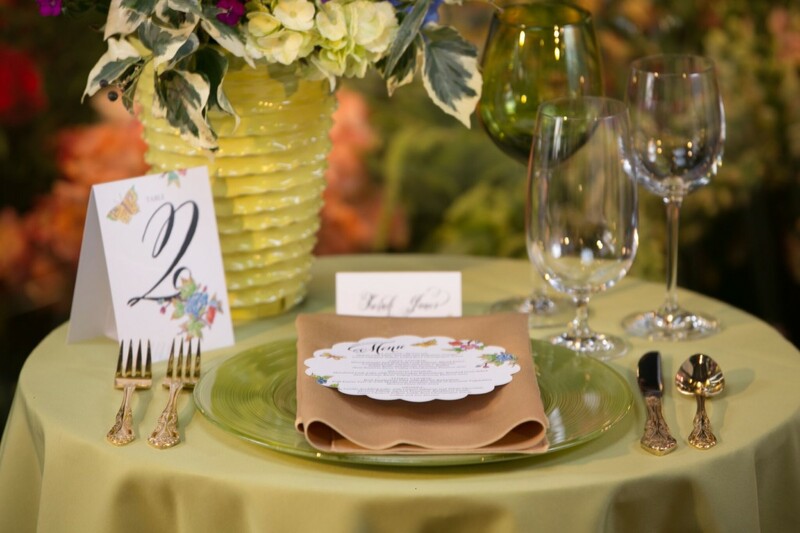 It’s always a pleasure participating in styled shoots, and this vibrant shoot is no exception! 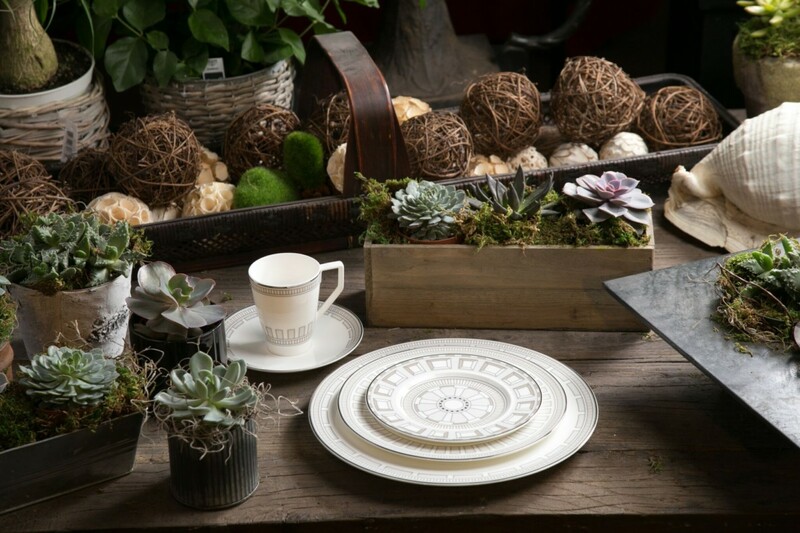 With Labor Day just behind us, it’s safe to say the summer season has come to a close and we’re looking ahead to fall. 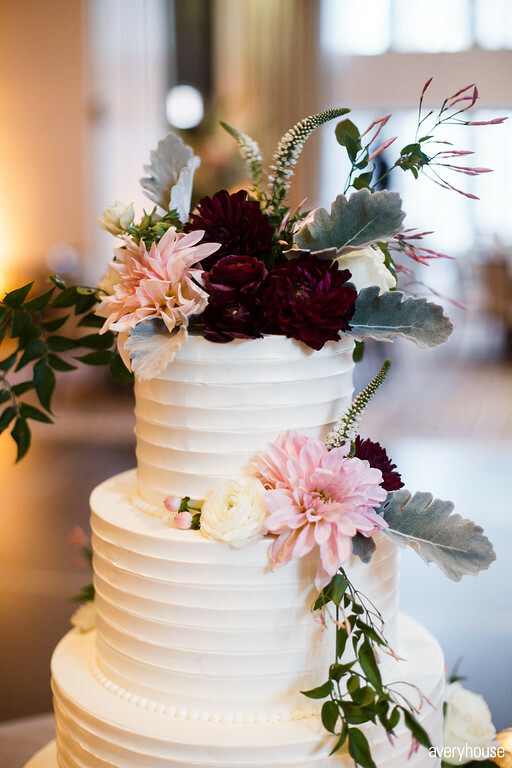 This styled shoot is the perfect way to kick off the season, with its rich color palette and decadent design. 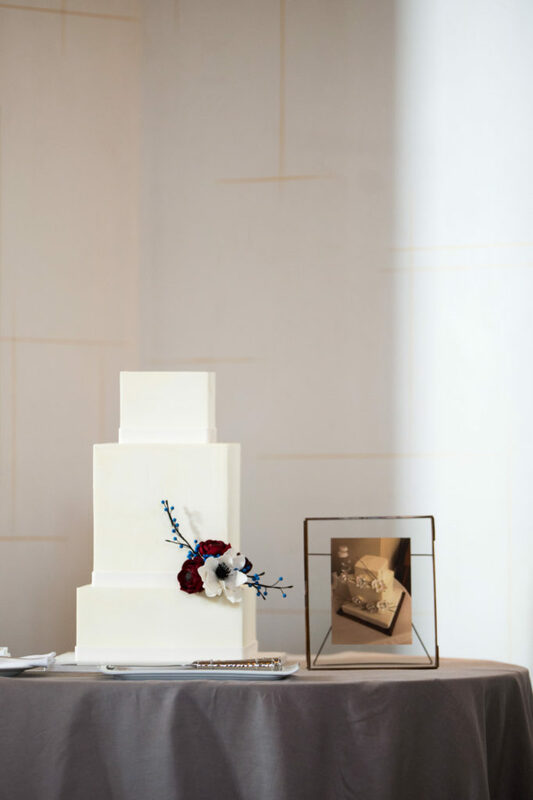 Geodes acted as a focal point for inspiration for this shoot, which we drew upon when designing this one of a kind four-tiered grey marble cake. 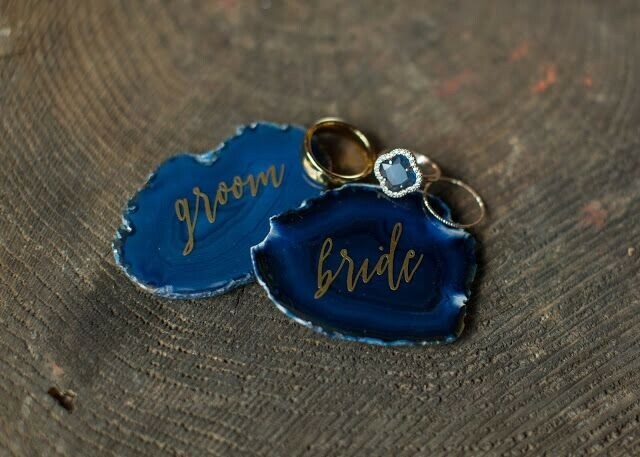 Hand-painted detailing mirrored the geodes, ultimately creating a fresh, fall-inspired look! 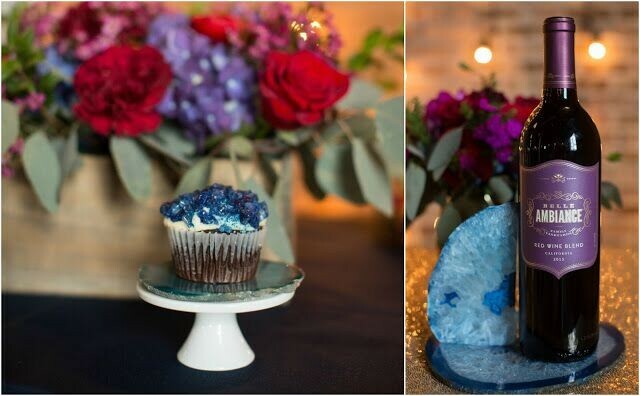 Check out more of this Geode and Gemstones shoot was as featured on the Chicago Style Weddings blog. 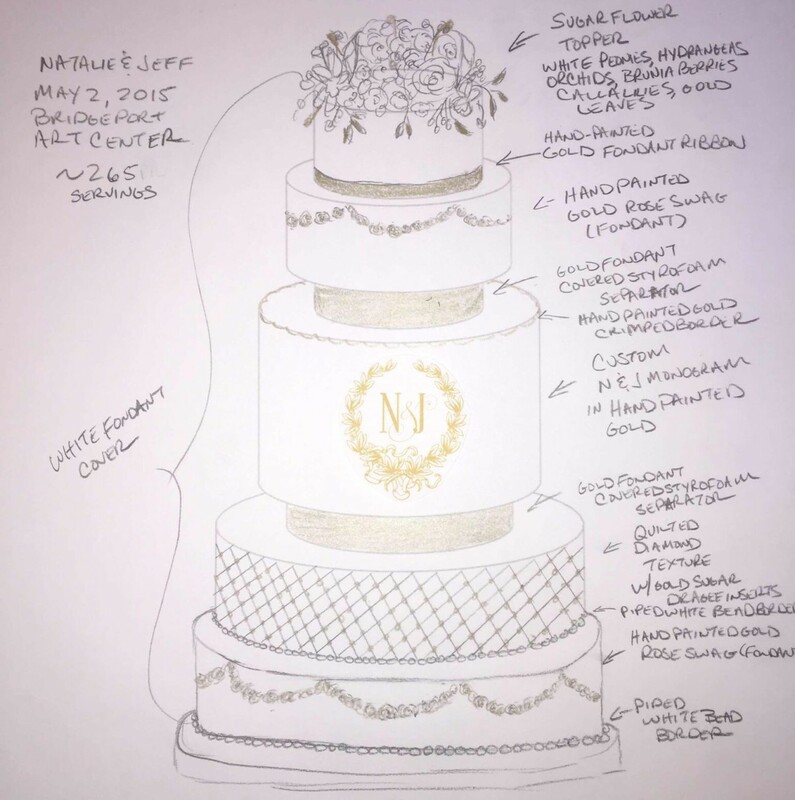 Call or email for a custom cake consultation today, we’d love to bring your dream look to life! 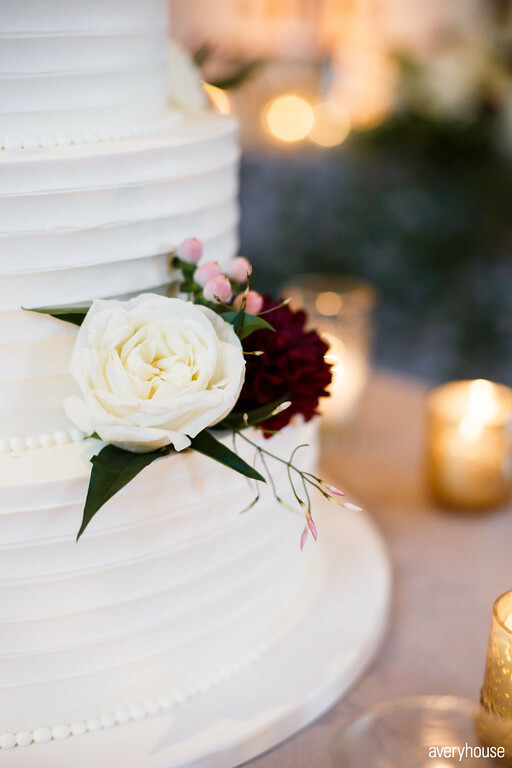 Your wedding cake should always be a representation of you as a couple; whether you’re inclined towards a sophisticated all-white design or a floral-adorned masterpiece, your cake presents a great opportunity to be creative! 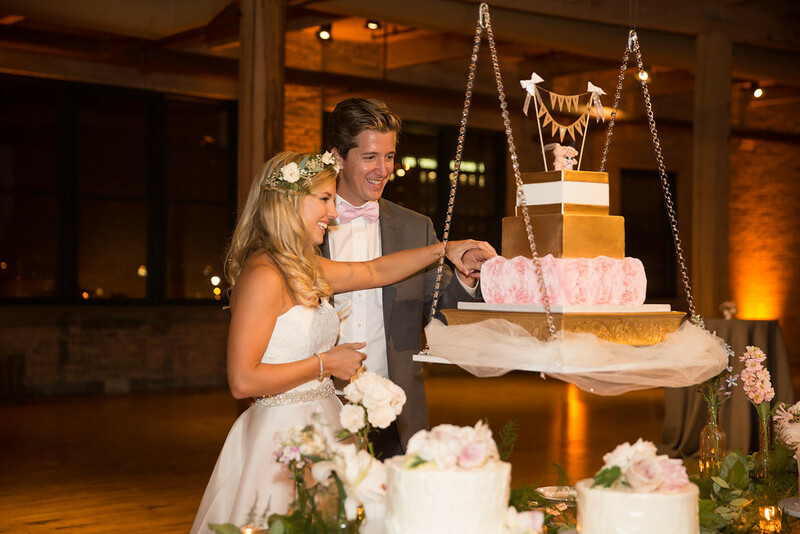 For Jessica and Brody’s Chicago wedding day, their wedding cake was nothing short of spectacular. 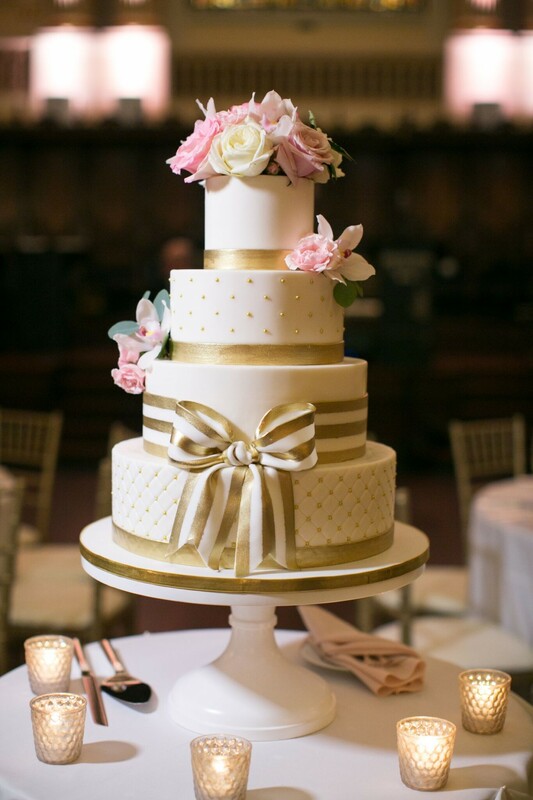 Full of exquisite gold detailing and fresh florals, this one of a kind cake truly acted as a focal point for their love-filled reception. 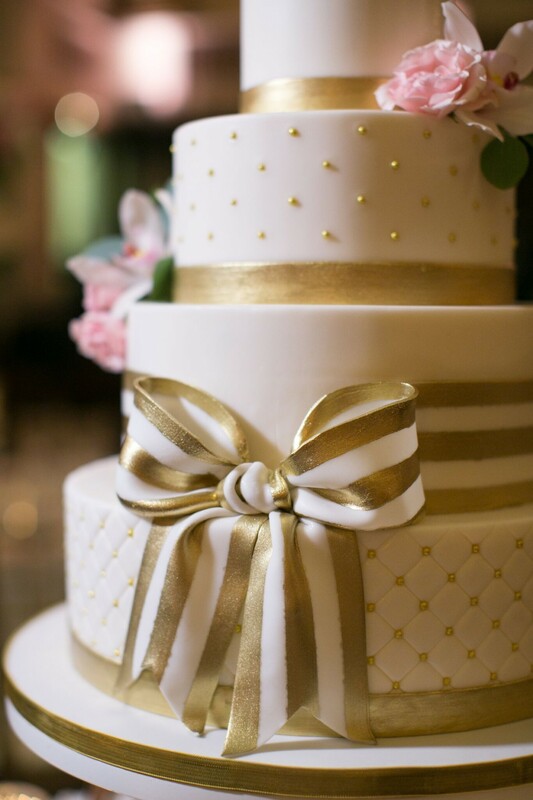 We had so much fun detailing this four-tiered design, and love how the gold and white fondant ribbon ties together the whole cake. 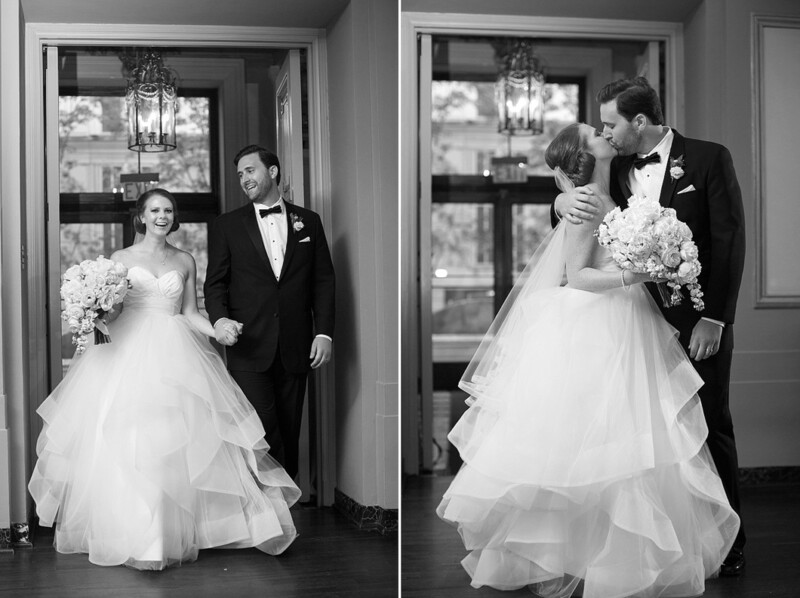 For more photos from this gorgeous wedding, check Christy Tyler Photography’s blog post here. 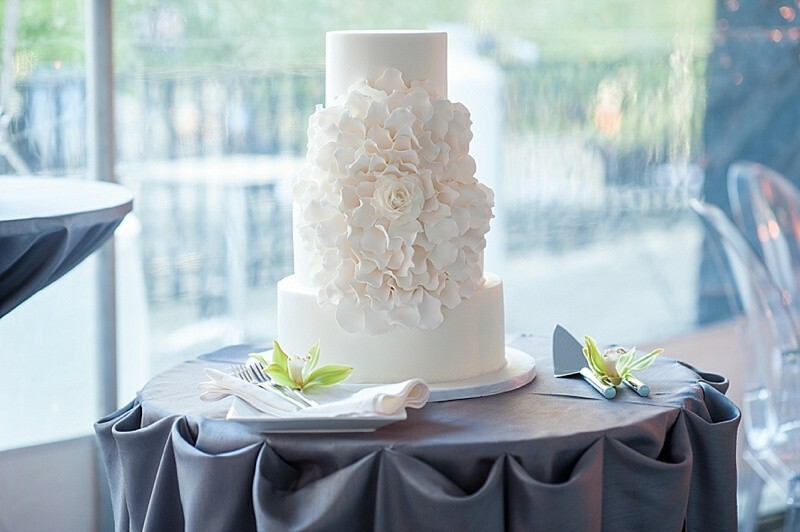 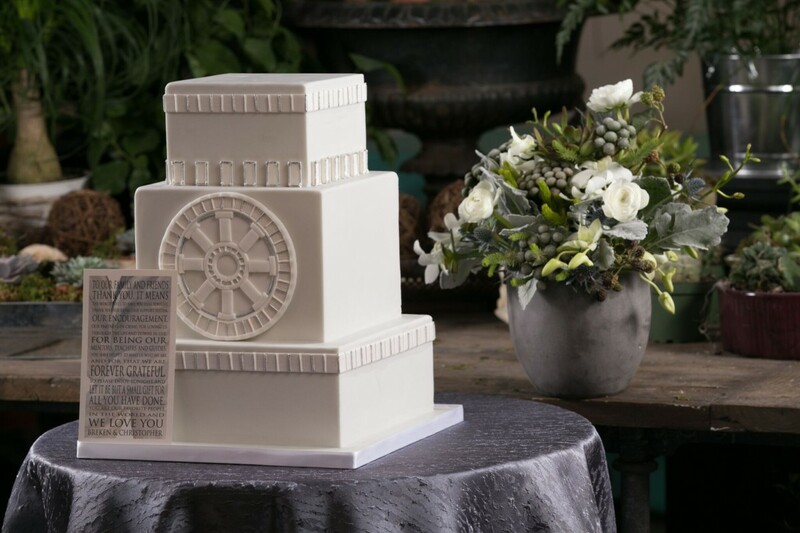 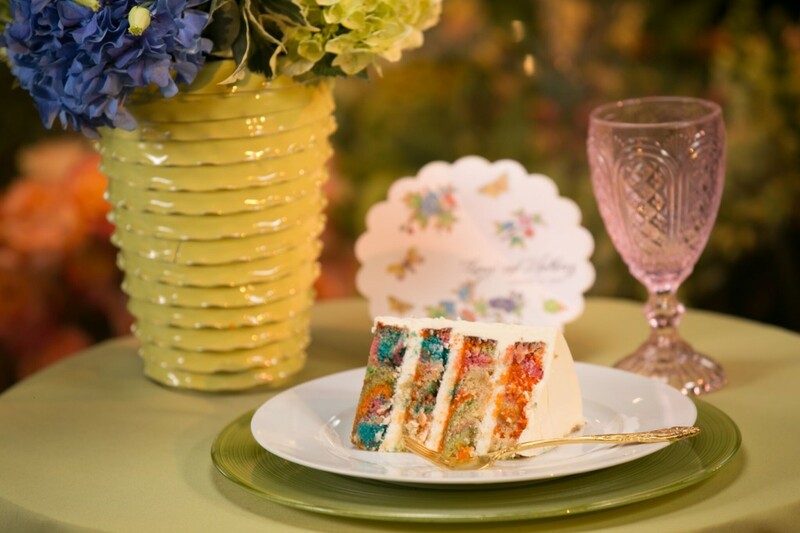 Call or email for a consultation today, and let’s discuss your perfect wedding cake! 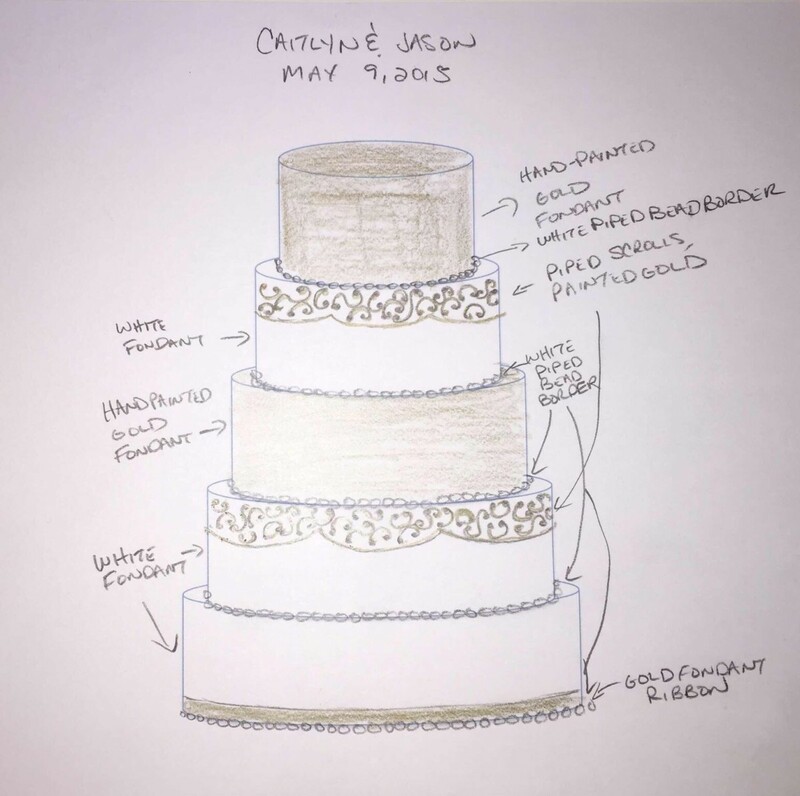 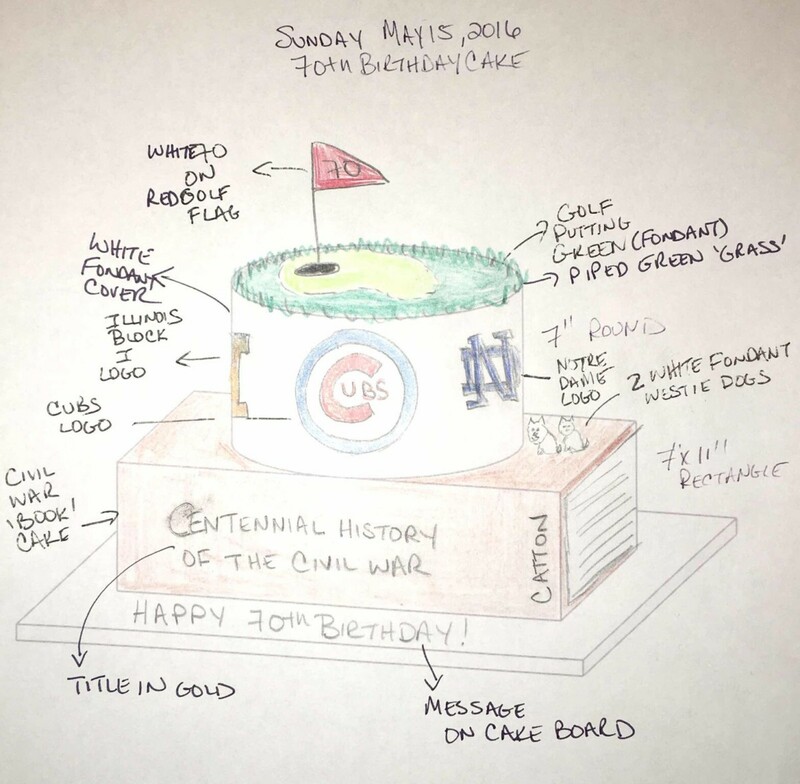 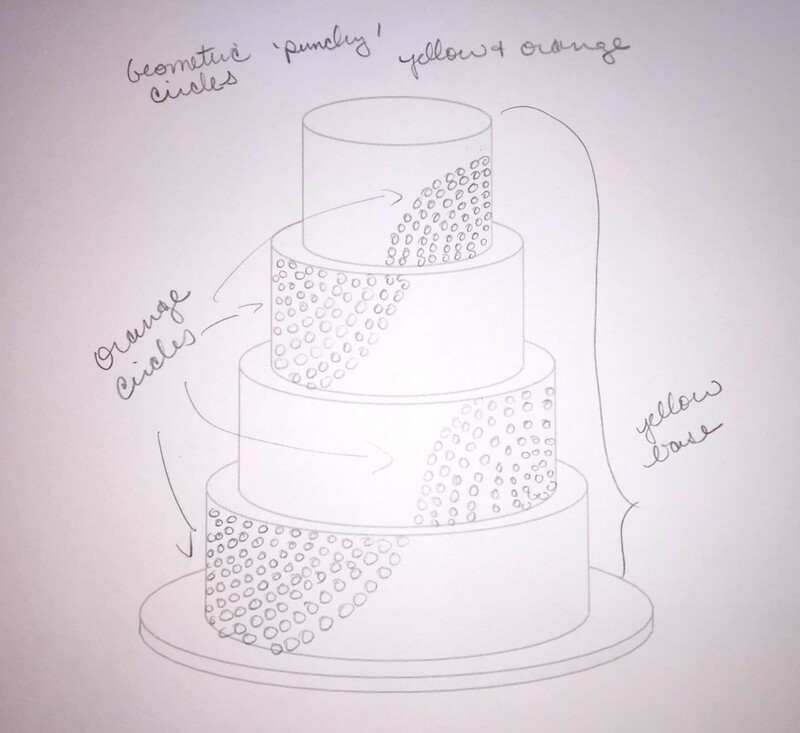 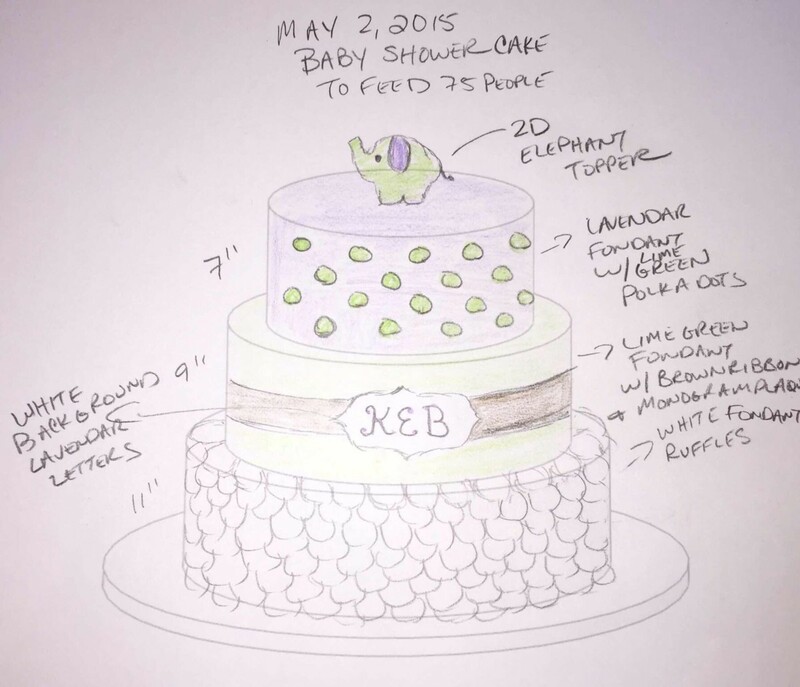 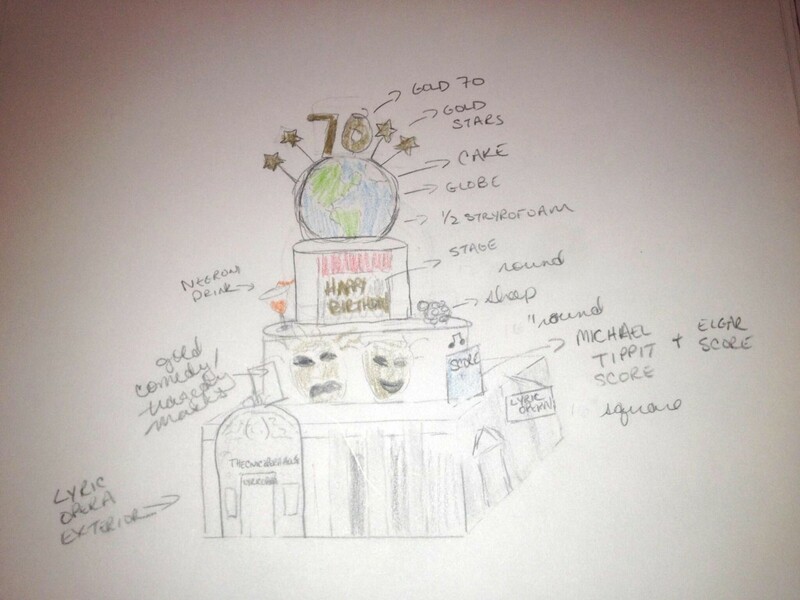 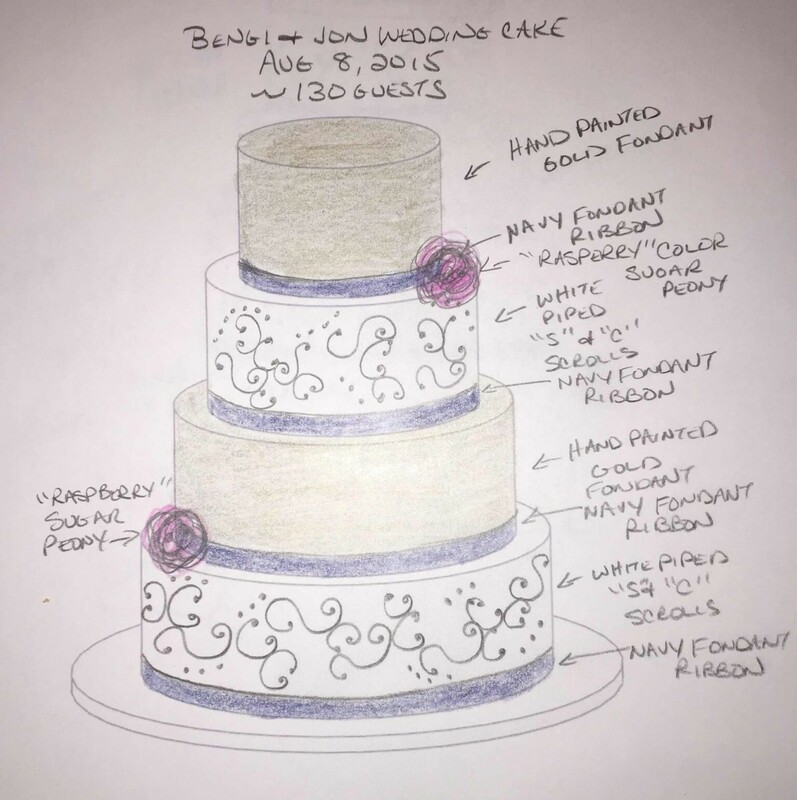 We pride ourselves on our custom cake creations, and begin each consultation the same way—with a sketch! 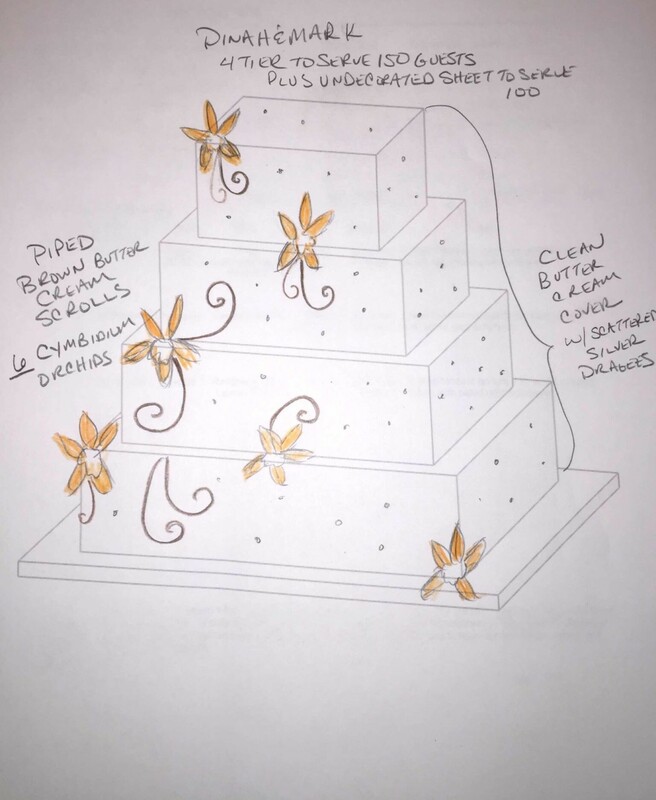 While we do have a few staple designs and décor accents, each cake is constructed based on a client’s individual vision. 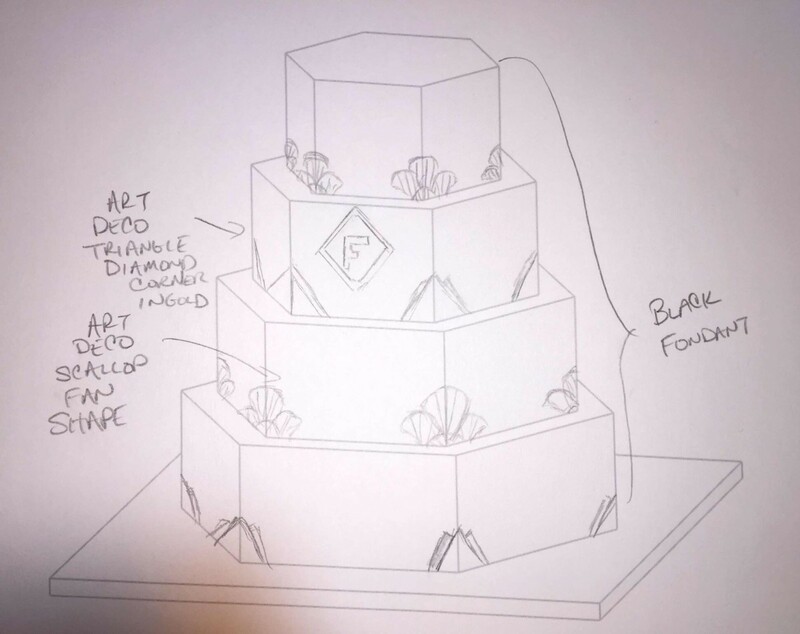 Reflecting on past cake sketches, it’s fun realizing just how different each and every cake truly is, and how much dedication is poured into each project. 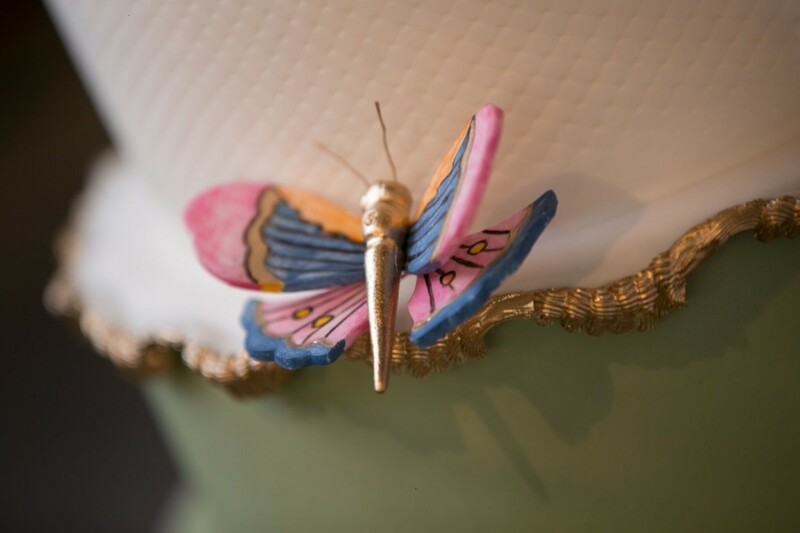 We love nothing more than a custom cake creation, especially when it comes to executing something entirely new. 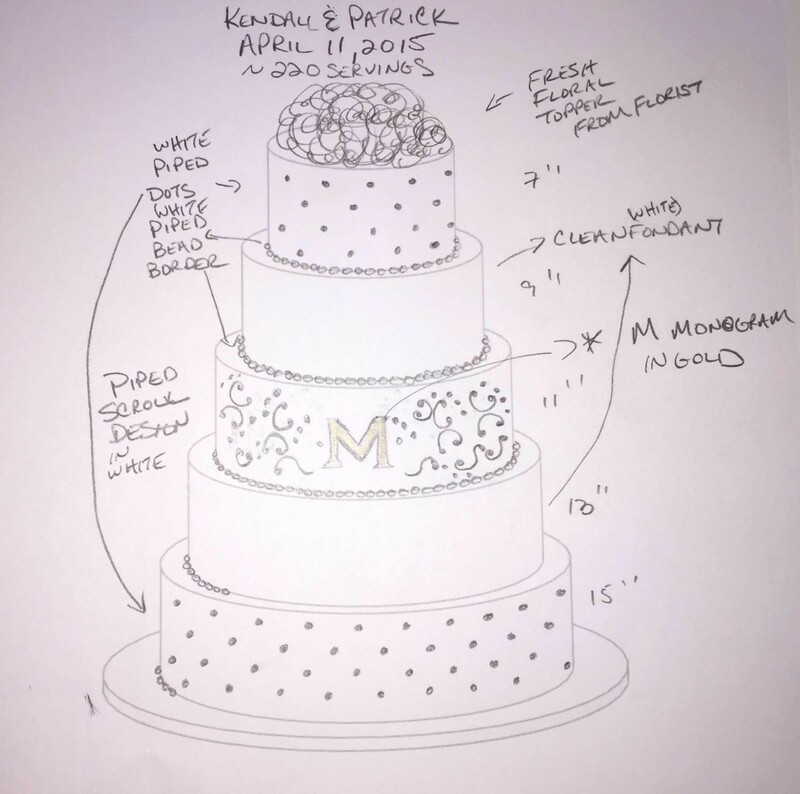 Take a look back at these past sketches with us, and see if you recognize any of these sketches in real life on our Instagram feed or from a past event! 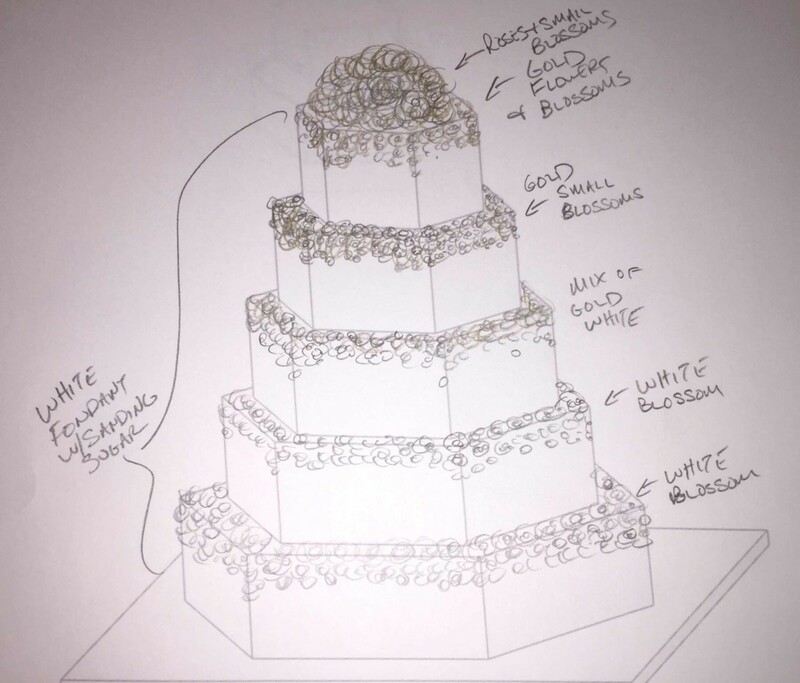 Call or email for a custom consultation and let’s get sketching! 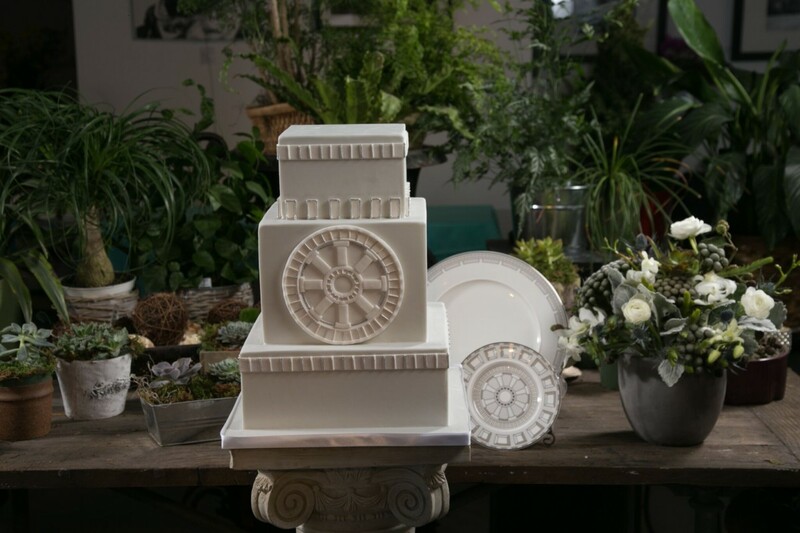 We absolutely love it when couples ask us to create not one, but two unique cakes for their wedding celebrations. 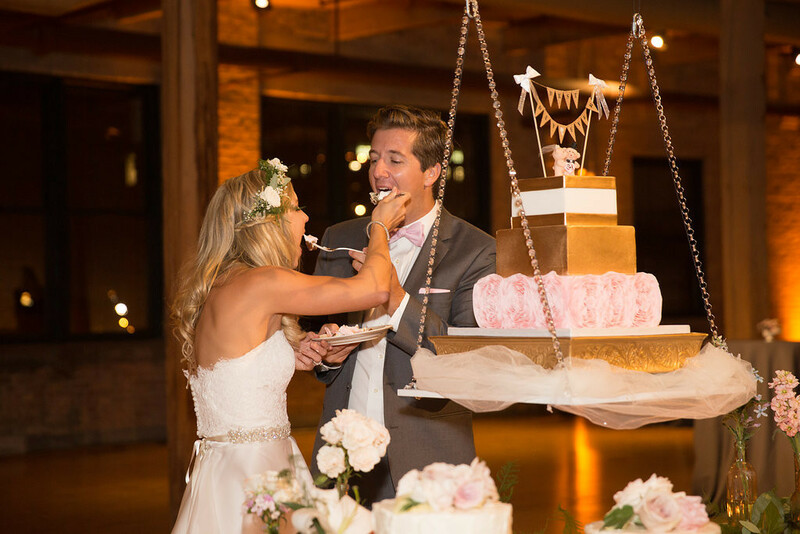 Lauren and Lee, who got married last summer at the Museum of Contemporary Art, had a fun and personal groom’s cake as well as a gorgeous, four tier wedding cake. 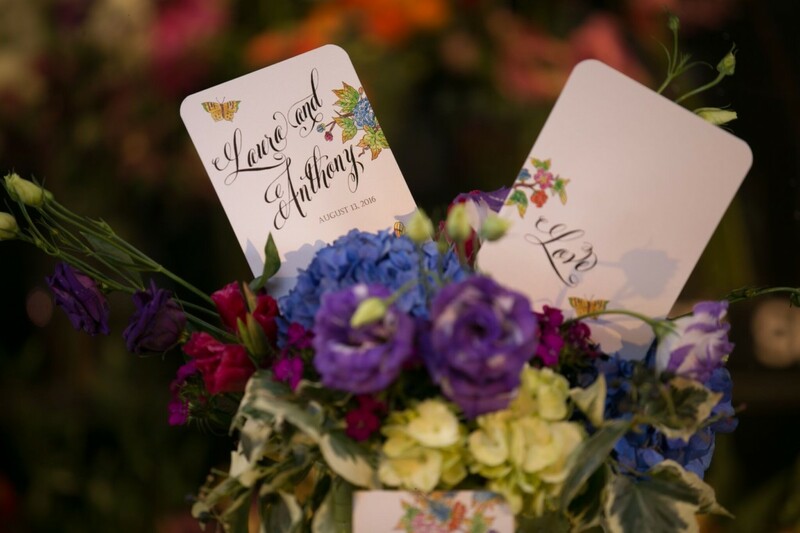 Kesh Events did a fantastic job planning their beautiful event. 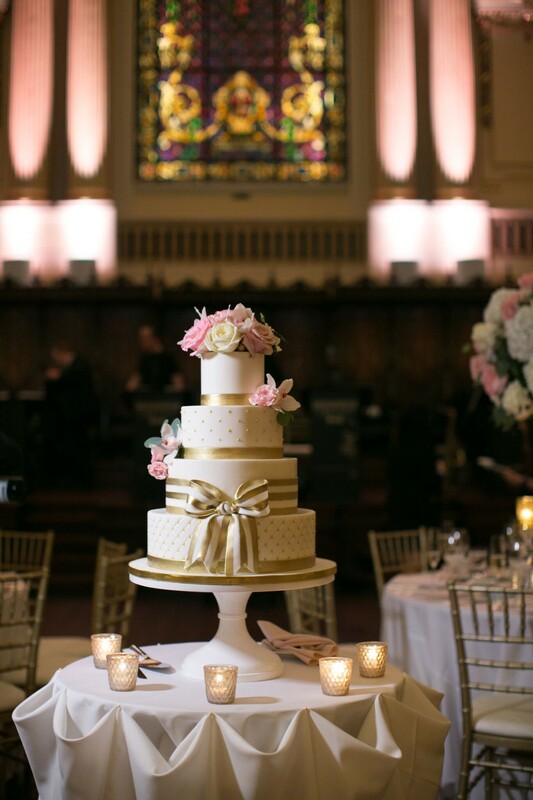 Thank you to Carasco Photography for sharing these lovely images of the couple and their two cakes below! 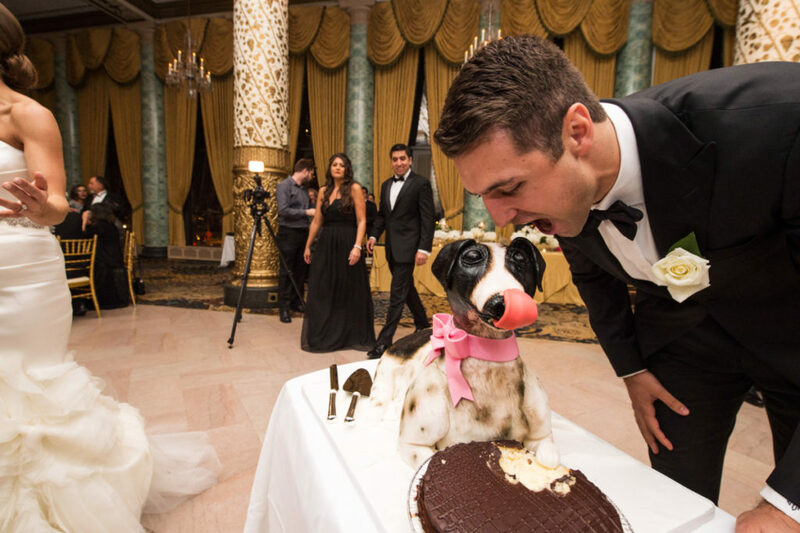 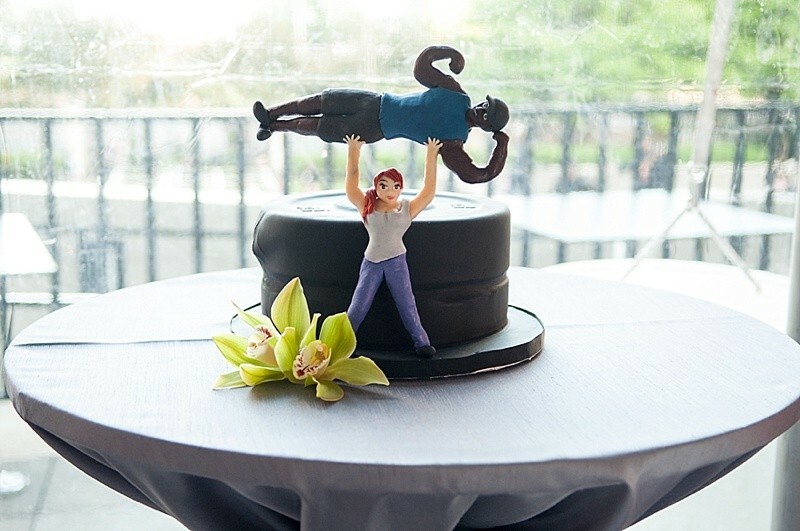 Lauren and Lee’s fun personalities really shone through the groom’s cake. 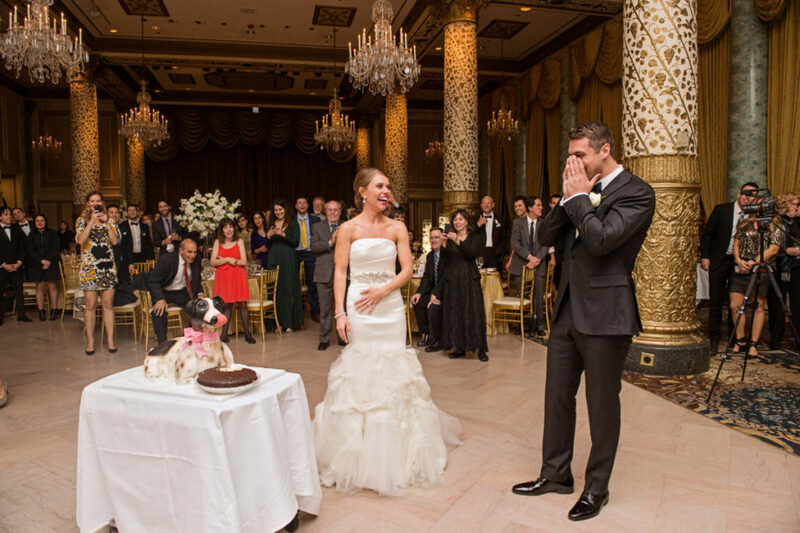 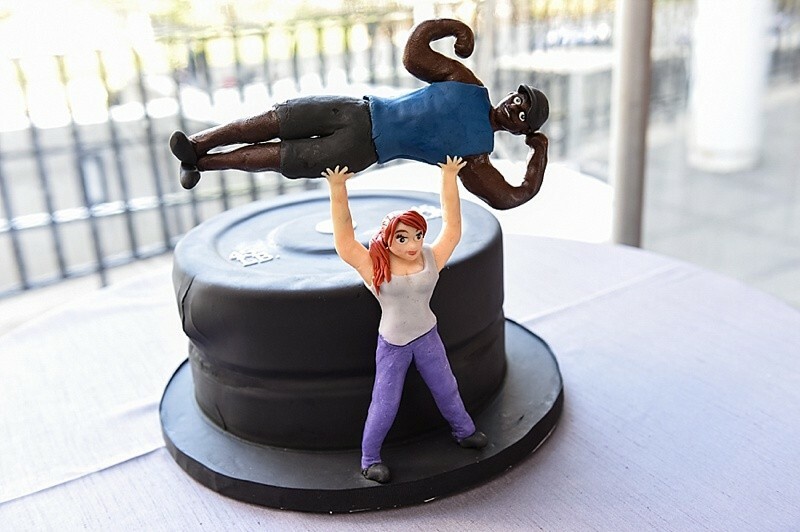 The two of them love working on their fitness together, so Lauren thought she’d display that in the form of a surprise groom’s cake for Lee. 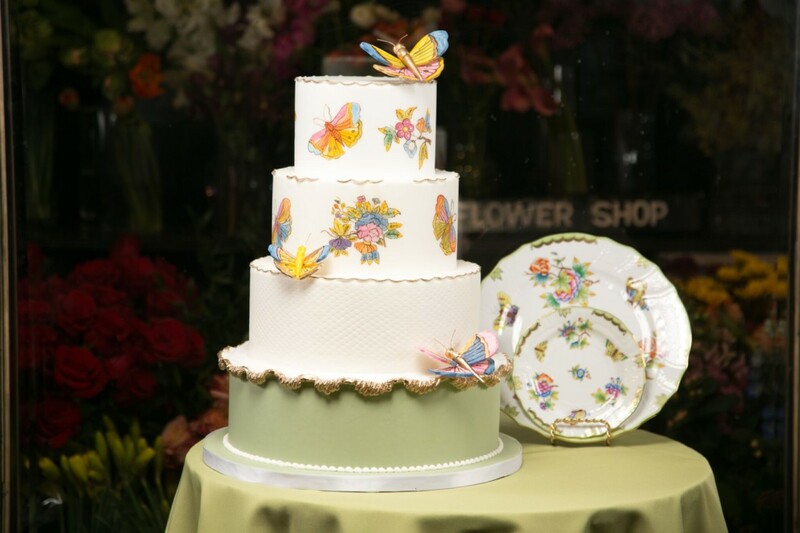 The cake itself took the form of two stacked weight plates, and standing in front of it was Lauren’s fondant figurine holding up Lee’s. 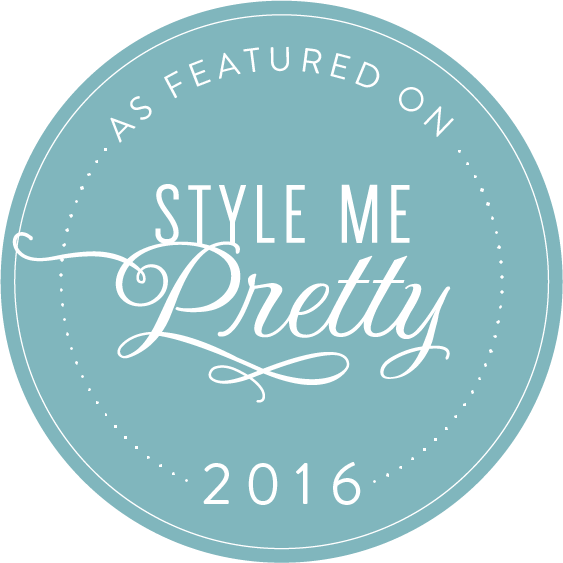 Too cute – girl power! 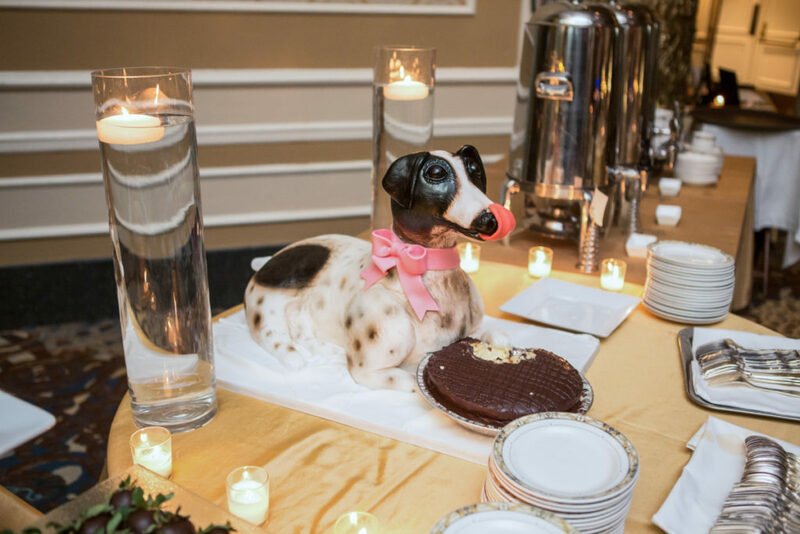 Lee’s groom’s cake was a yummy chocolate cake with peanut butter buttercream. 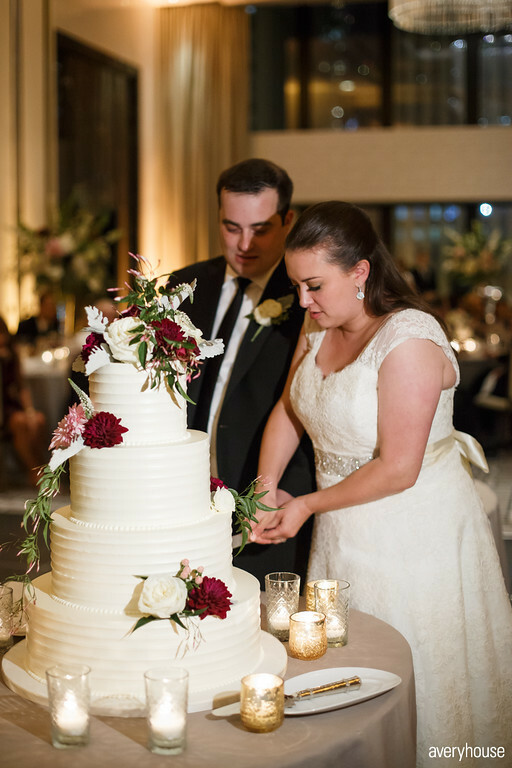 Their wedding cake took on a completely different style – it was a beautiful, four tier cake with a large open fondant garden rose. 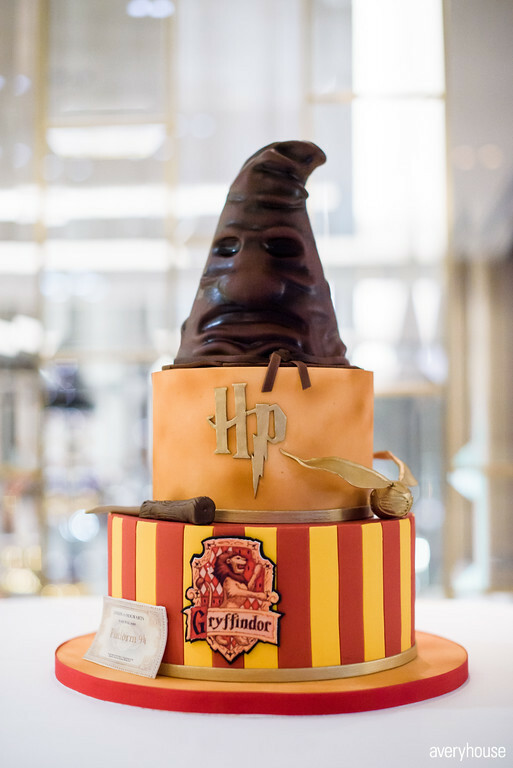 The flavors included almond and chocolate cake with salted caramel buttercream and turtle filling. 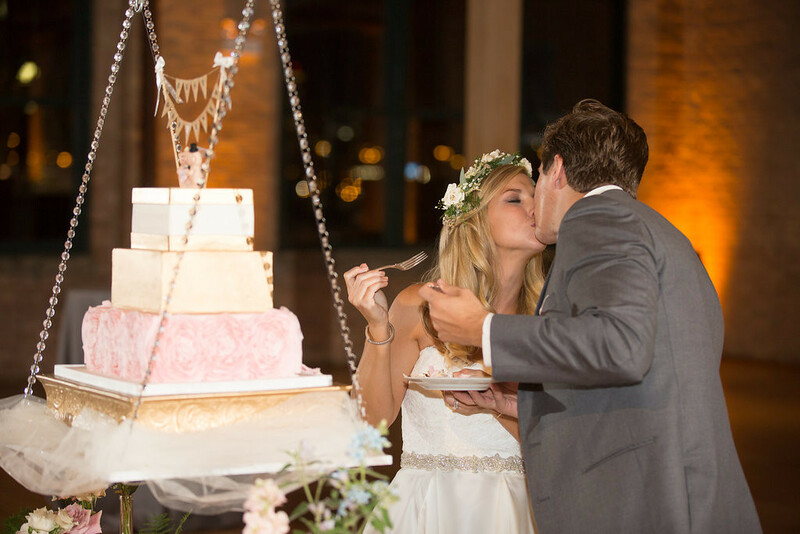 Having a groom’s cake in addition to your wedding cake is a great way to really inject your and your fiance’s personality into the decor. 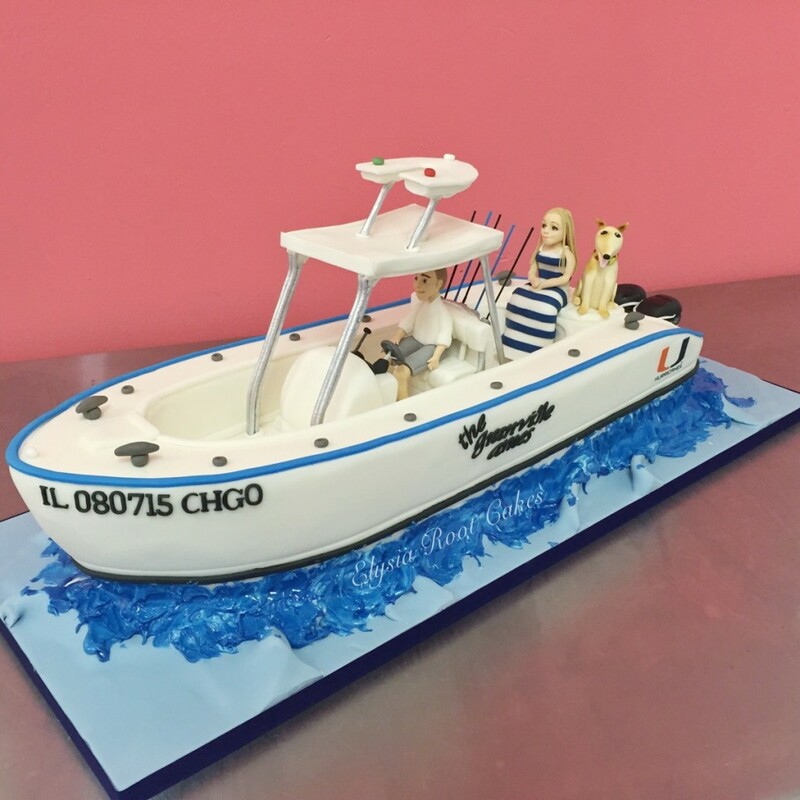 If you have a unique idea in mind for a groom’s cake (or wedding cake) , give us a call at 312-344-1046 or email us today! 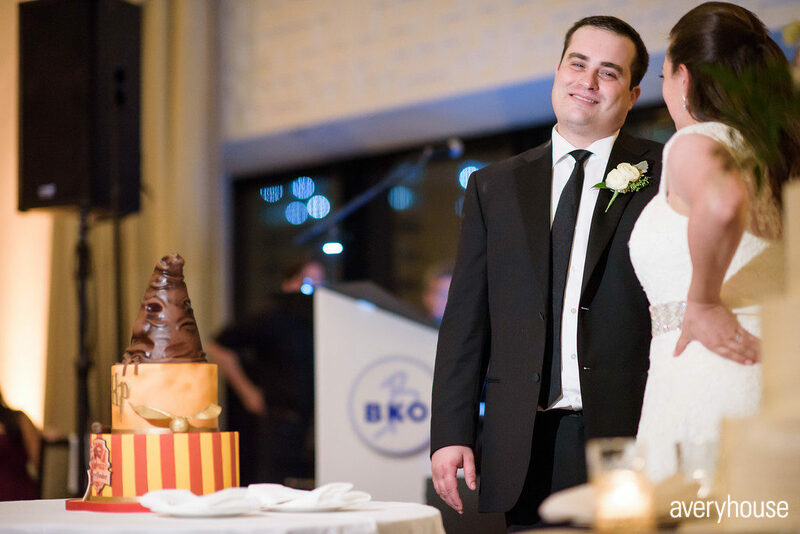 We had a blast making both a groom’s cake and wedding cake for Kellie and Scott this past August! 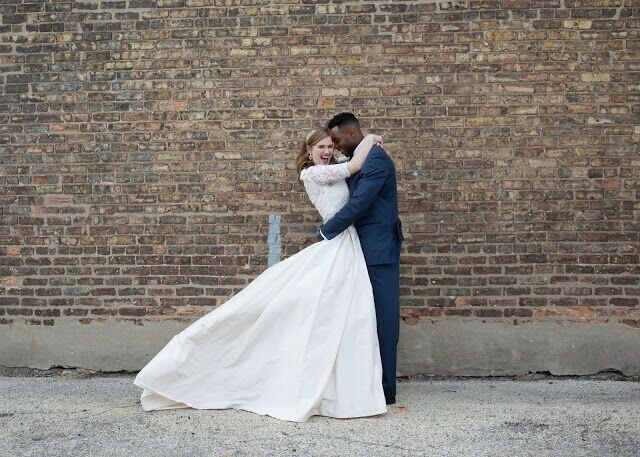 The couple- from Delray Beach, Florida- tied the knot here in the Windy City during a gorgeous ceremony at the Skyline Loft at Bridgeport Art Center. 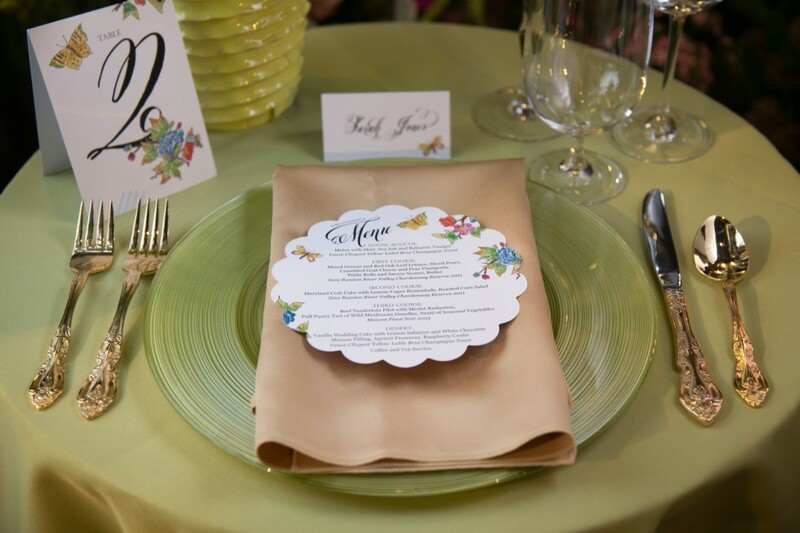 Tiffany Munster, Owner of Soiree Weddings & Events put together a stunning event and we were so happy to be part of it! 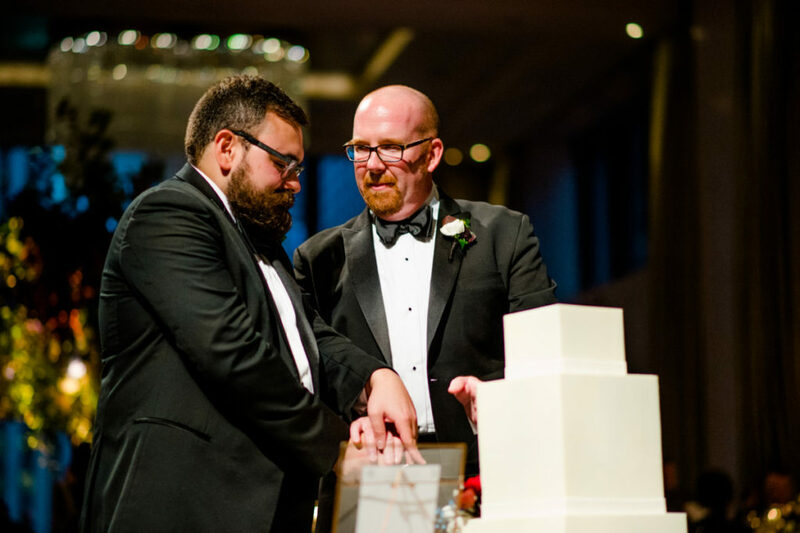 Take a look at the photos we took of the groom’s cake, and the professional photos of their hanging wedding cake by Cristina G Photography. 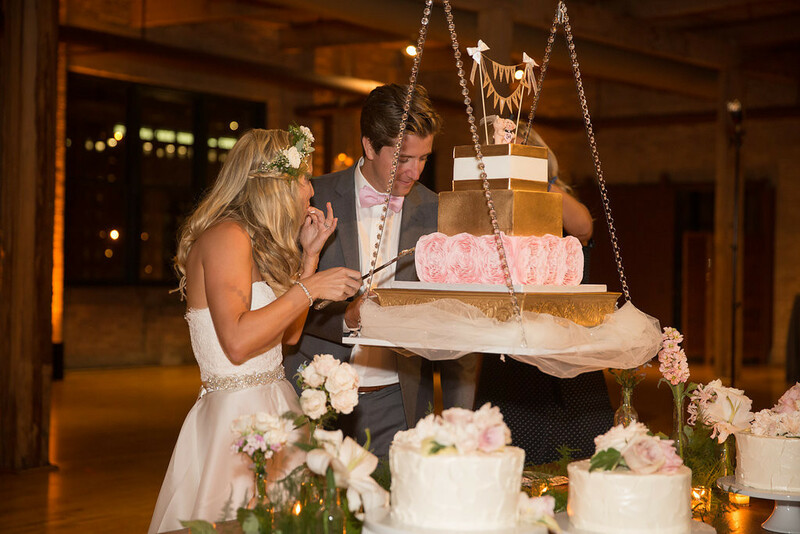 The night before their wedding, Kellie and Scott held their rehearsal dinner at River Roast where they enjoyed a special groom’s cake for dessert. 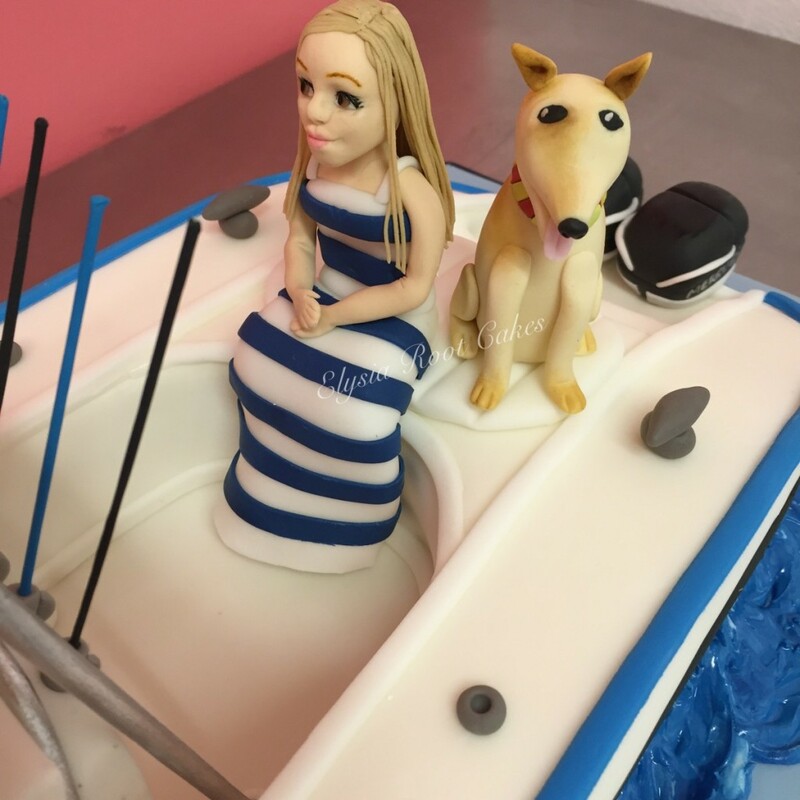 The cake was a sculpted fishing boat that included three passengers: Kellie, Scott, and their pup Kade! 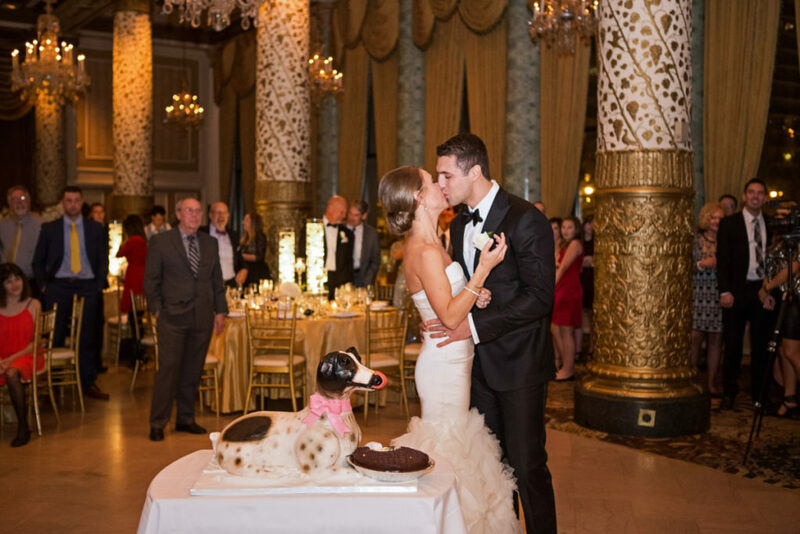 That was the couple’s way of including their furry friend into their wedding. 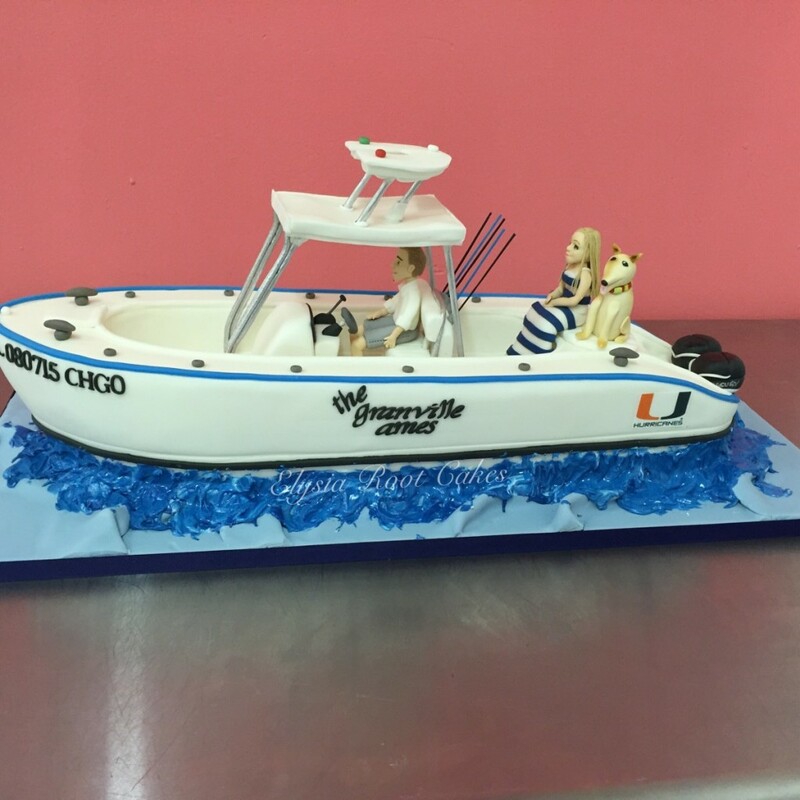 The boat was called “The Granville Ames”, and featured a University of Miami logo on the side to honor their alma mater. 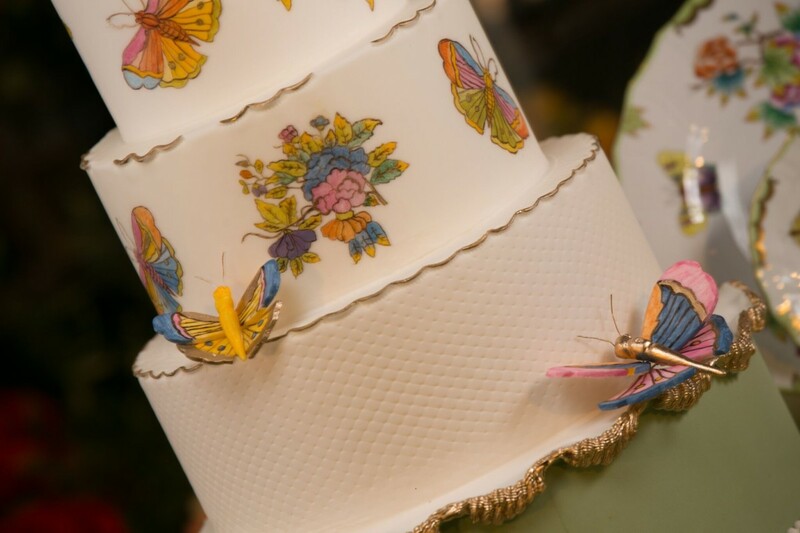 It was a delicious lemon cake with lemon buttercream! 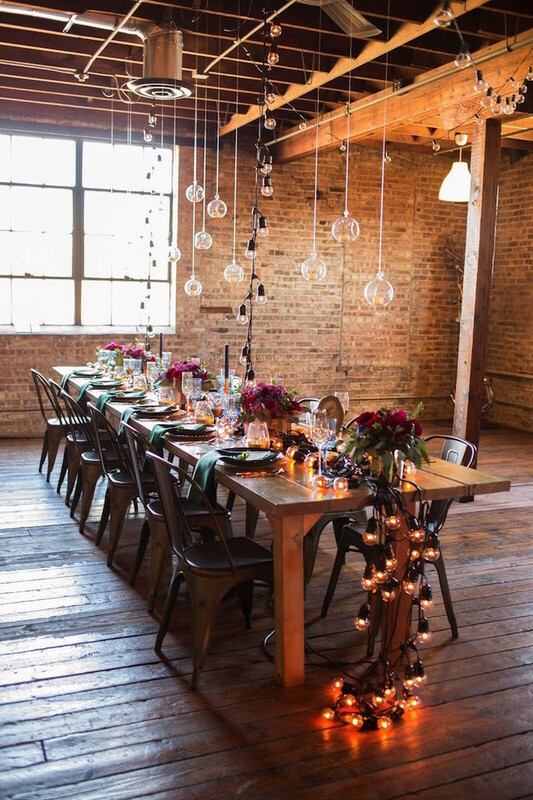 Kellie and Scott’s wedding took place the next day at the Skyline Loft at Bridgeport Art Center. 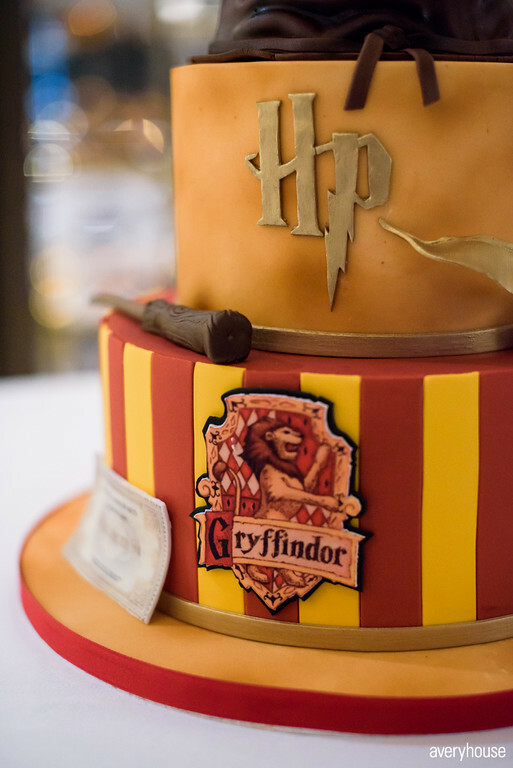 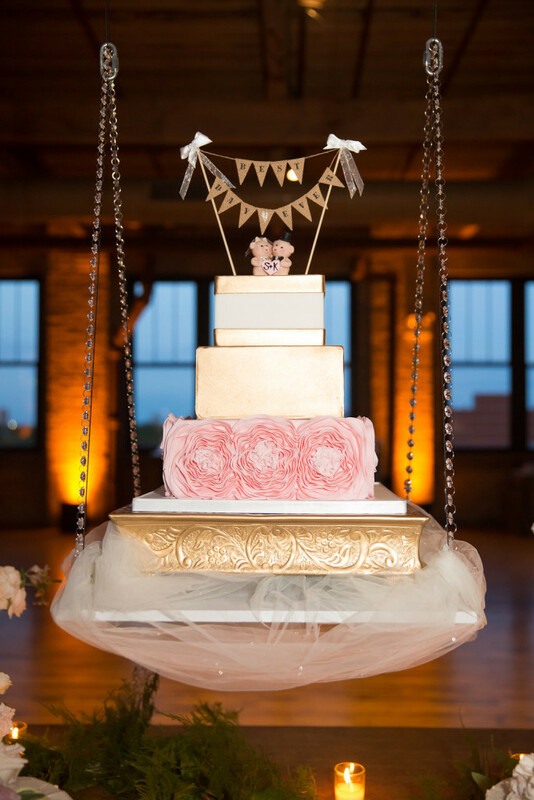 They displayed their beautiful cake in a bit of an unusual manner- hung from the ceiling! 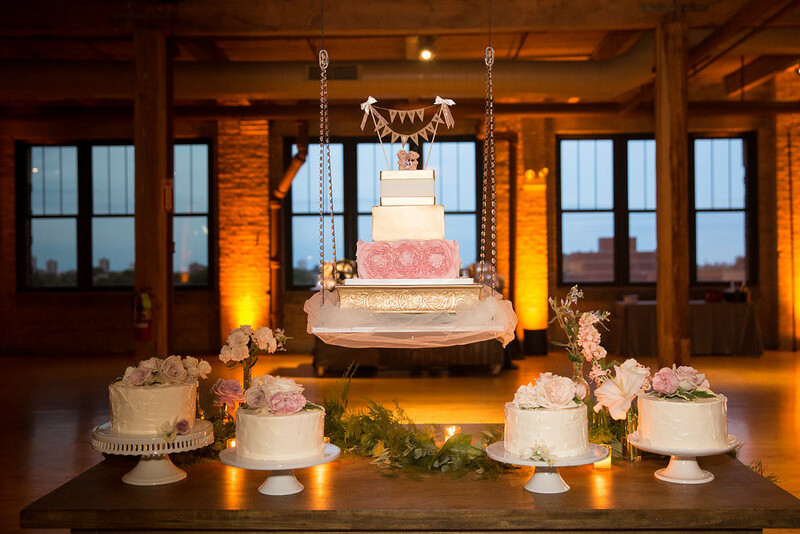 MDM Entertainment hung the cake after the room flip, so guests were surprised by its lovely display. 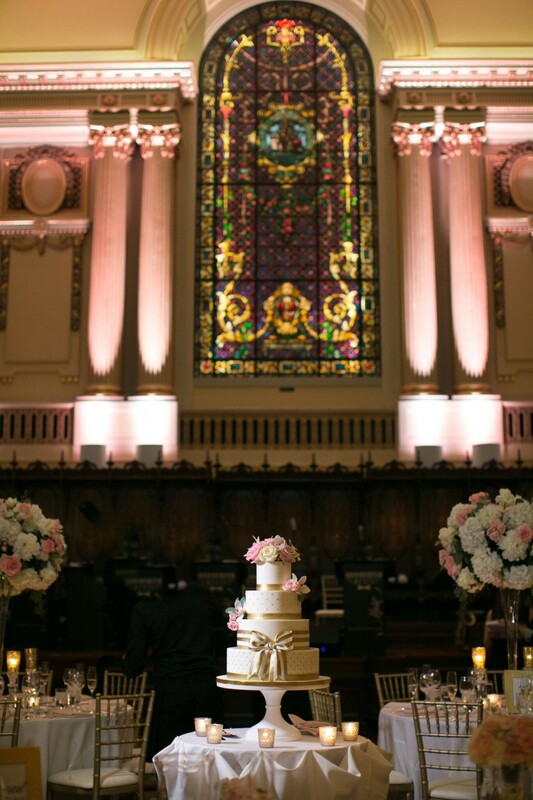 Instead of simply having one wedding cake for dessert, they wanted to have a full dessert table, so they had one large hanging wedding cake accompanied with four smaller single tier cakes. 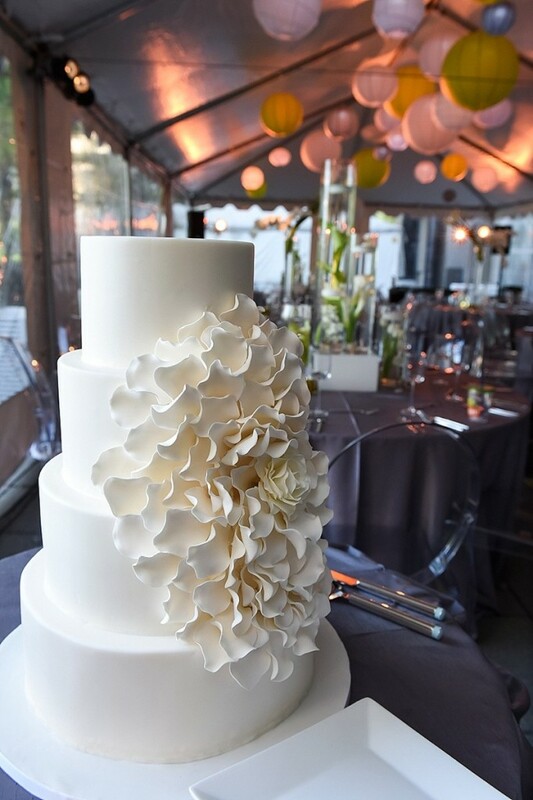 What a fantastic look that has been achieved, I’m sure any wedding cake maker would be proud of this. 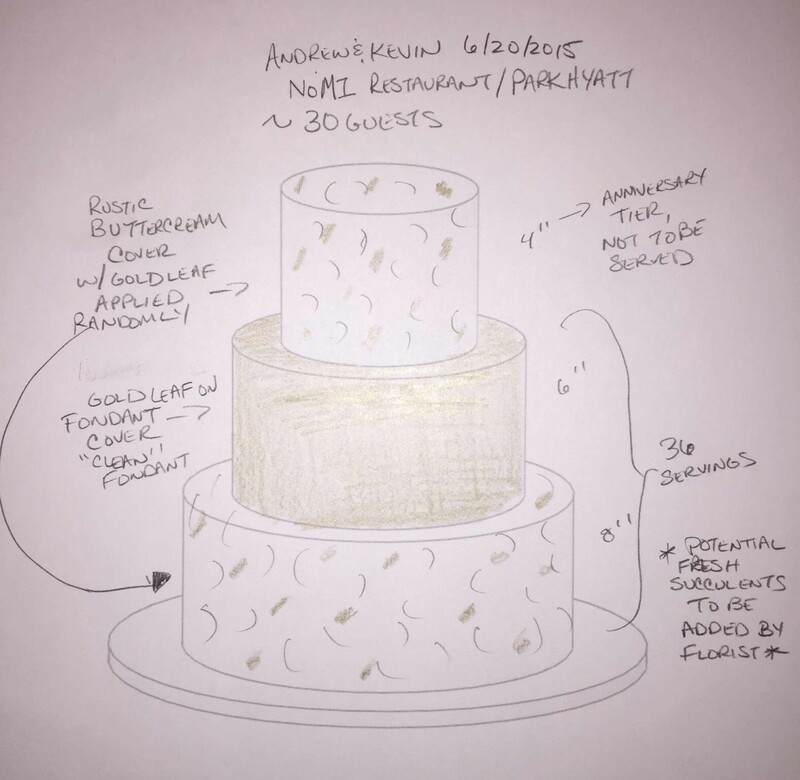 The wedding cake was carrot cake with pecans and cream cheese filling. 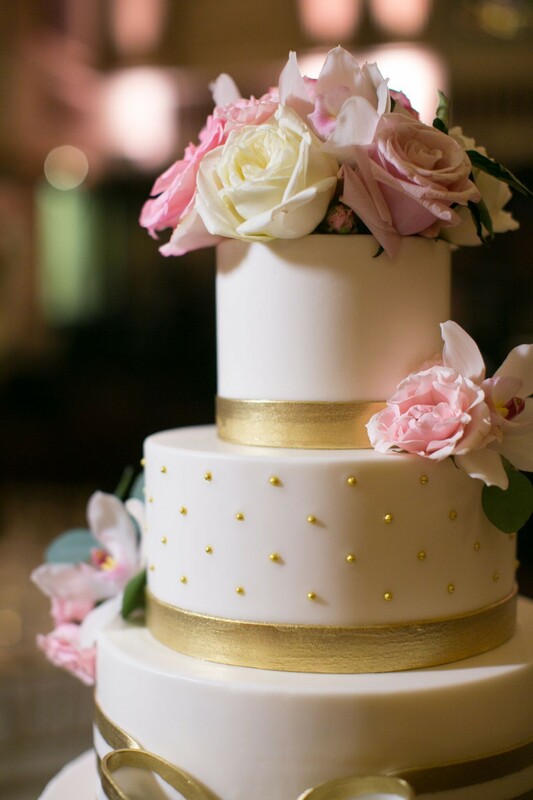 The other cakes were lemon cake with lemon buttercream, lemon cake with passion fruit buttercream, and then chocolate cake with salted caramel buttercream. 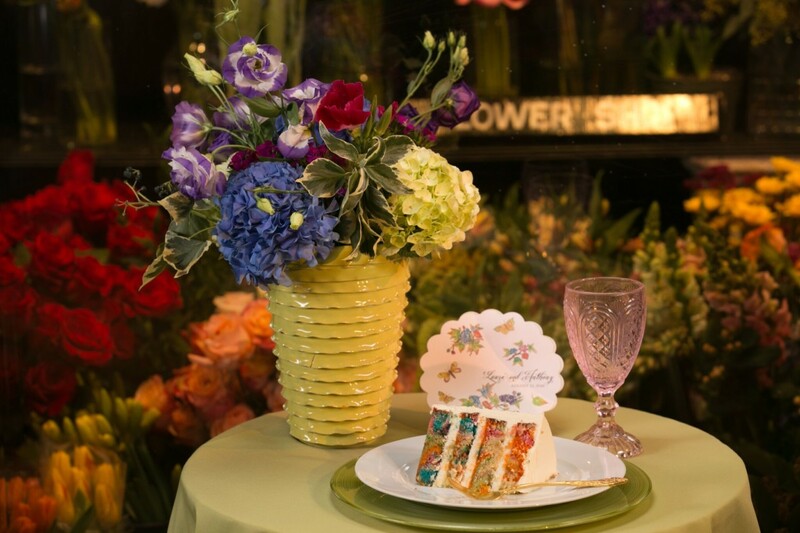 Vale of Enna provided fresh floral to adorn their beautiful side cakes. 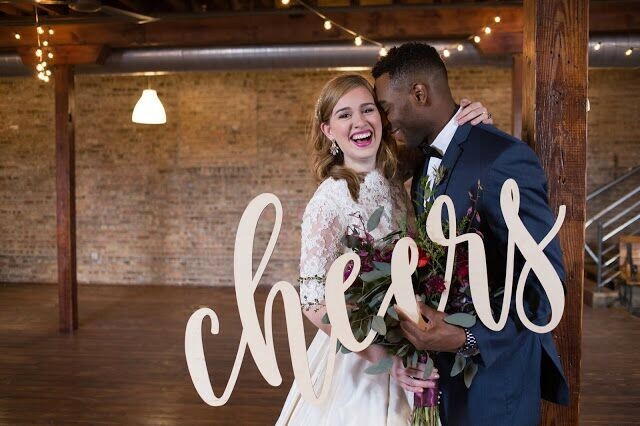 Other vendors that helped make Kellie and Scott’s wedding day great were Toast & Jam DJs, Paramount Events, Avant Garde Media Studio, and ShutterBooth. 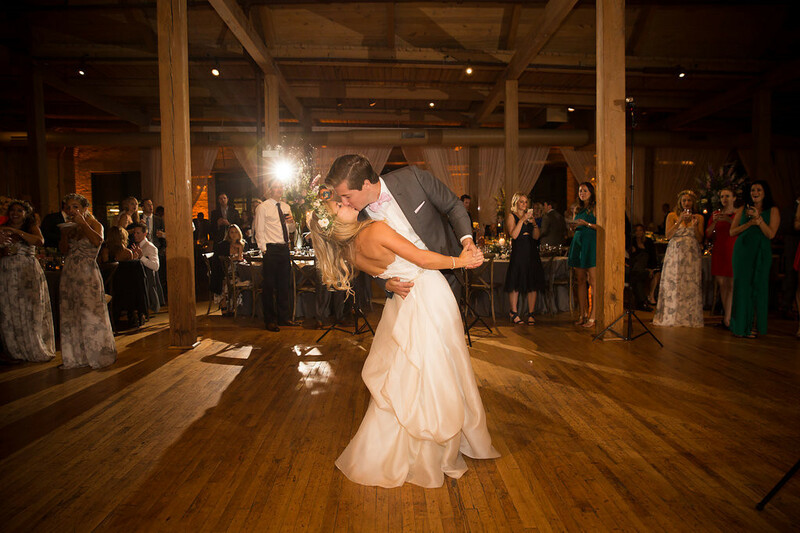 Cheers to the love birds, Kellie and Scott! 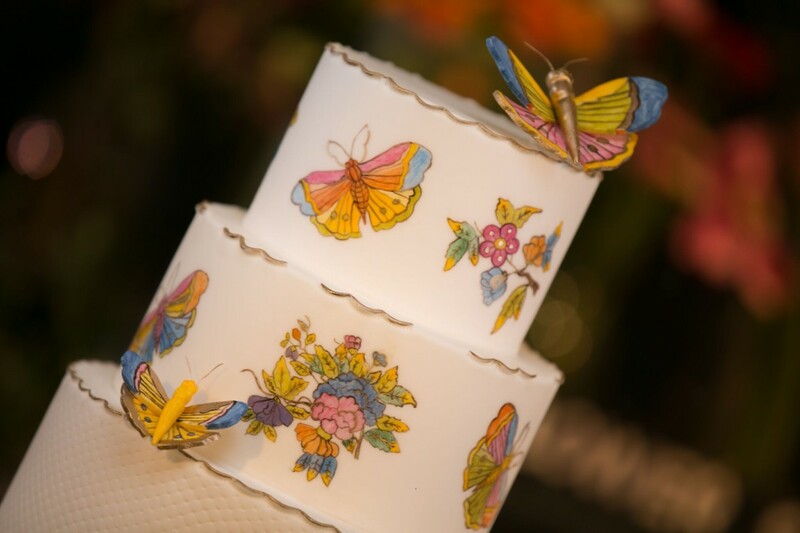 If you have a unique groom’s cake or wedding cake idea for your big day, we would love to hear it! 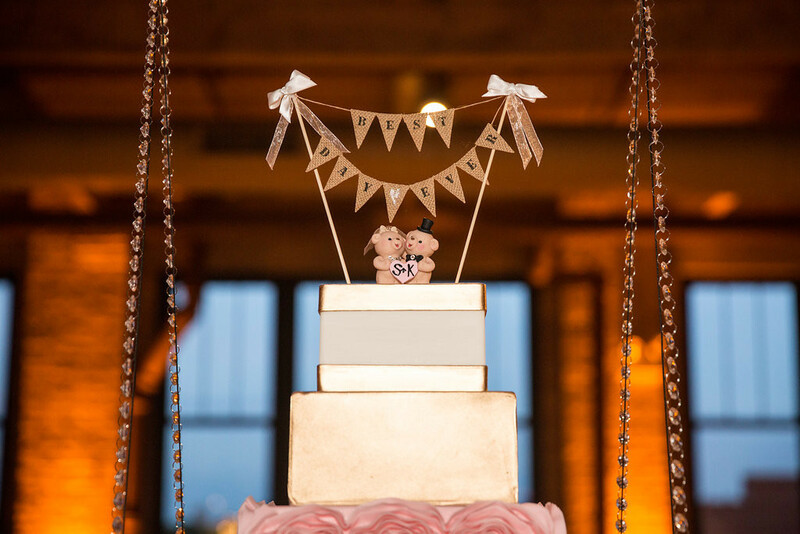 Contact us today to set up an initial consultation: 312-344-1046 or info@elysiarootcakes.com.